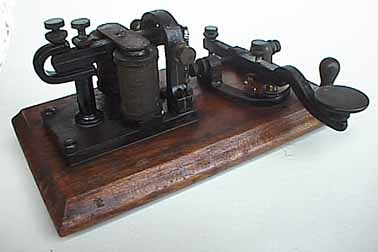 After Morse's successful 1844 demonstration of sending the MORSE code with a key called the "Correspondent" made by Vail to a "register" that made ink marks on paper tape, numerous manufacturers began producing apparatus to take advantage of this new technology. 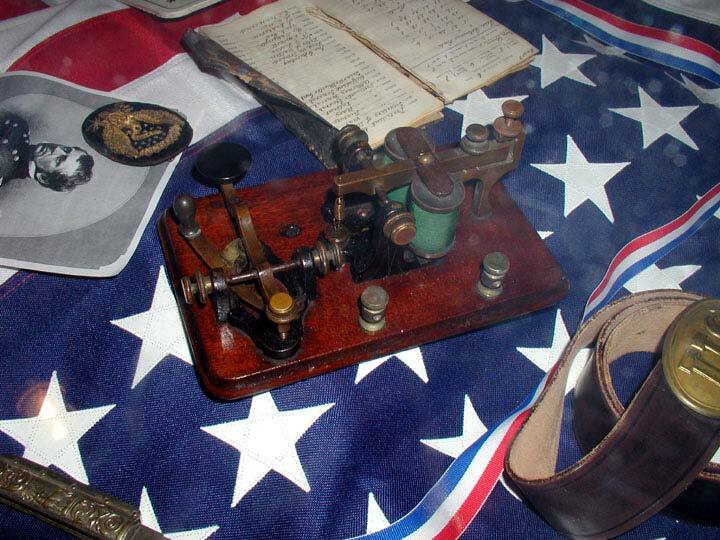 By the 1860's Civil War, several kinds of keys, registers, and sounders were in use. They were usually made of brass. 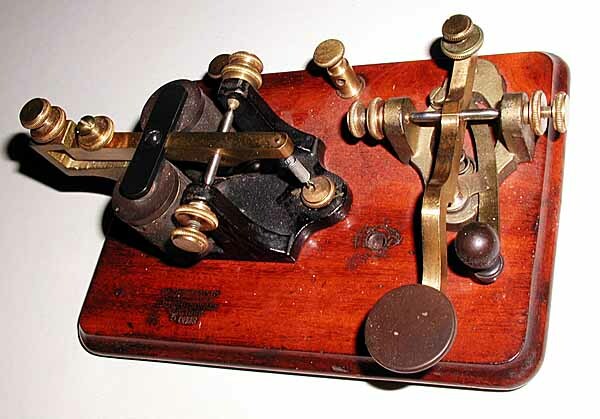 160 EARLY OTTOMAN EMPIRE TURKISH TELEGRAPH KEY:(23KB)This early Turkish land-line telegraph key was found in an antique store in Istanbul in 2003. The letters stamped into the bottom of the base suggest that it was used during the Ottoman Empire. 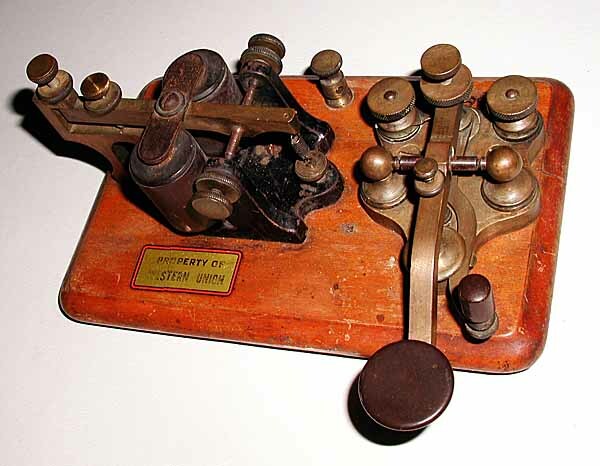 161 * EARLY OTTOMAN EMPIRE TURKISH TELEGRAPH KEY:(29KB)This early Turkish land-line telegraph key was found but not purchased in an antique store in Istanbul in 2003. Its basic design is quite similar to the design of # 160 above. 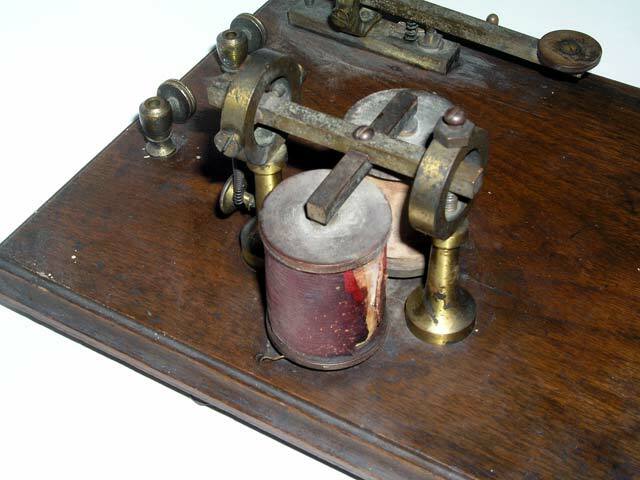 169 EXTREMELY EARLY GERMAN LAND-LINE CAMELBACK KEY:(31KB) This is a very early German Camelback key although the next key in the museum, number 170, is clearly much earlier. 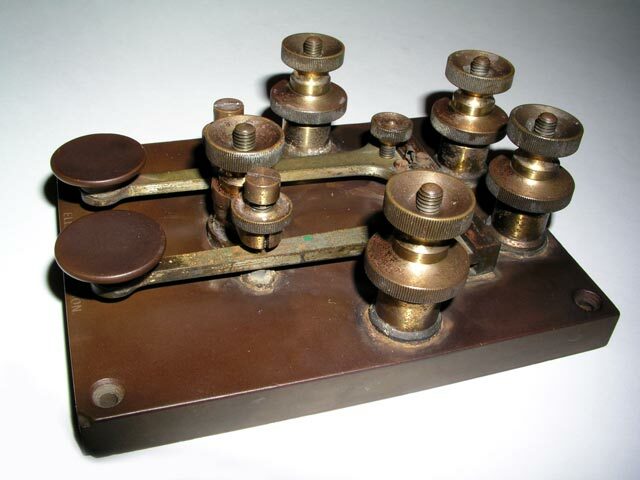 170 EXTREMELY EARLY GERMAN LAND-LINE CAMELBACK KEY:(14KB) This is one of the very earliest German Camelback keys that I have ever seen. 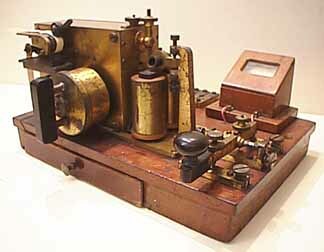 I believe that it dates to the early 1850's based on my research in the Siemens and Deutches Museum Archives in Munich. I believe that the number stamped on the side of the key is either a part number or the date in which it was placed in service. I have included several different views of the key. 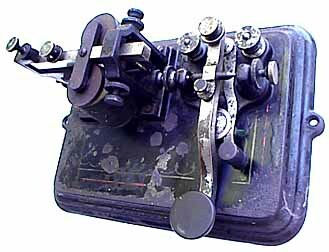 170aa ANOTHER EXTREMELY EARLY GERMAN LAND-LINE CAMELBACK KEY:(15KB) This is similar to the one above but perhaps slightly later. 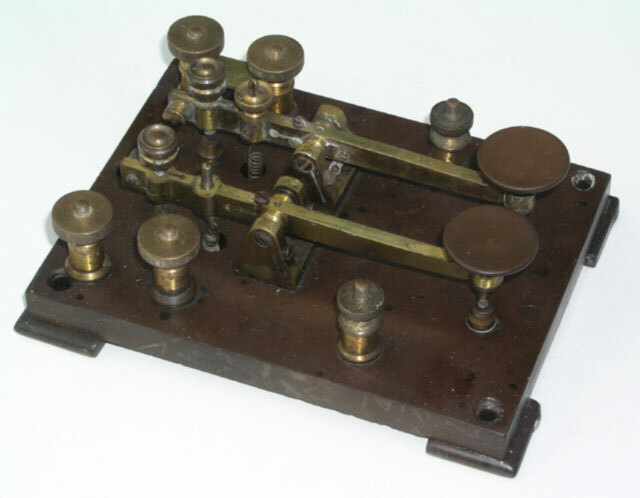 171 * VERY EARLY GERMAN LAND-LINE CAMELBACK KEY:(15KB) Lovely very early German camelback land-line key with the flat, non- adjustable spring and the heavy brass camelback lever that was characteristic of the earliest German telegraph keys. 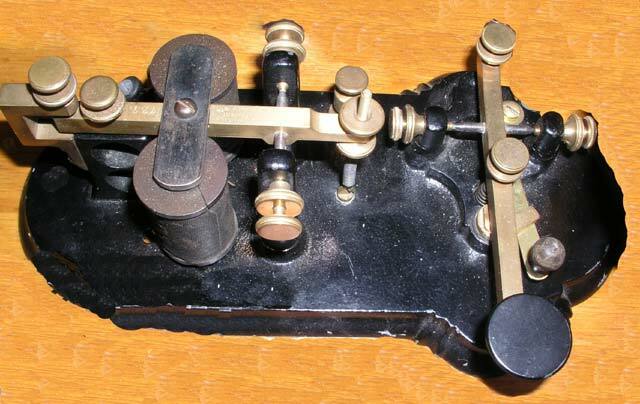 172 * EARLY GERMAN LAND-LINE CAMELBACK KEY:(19KB) Nice early German camelback land-line key with the flat, non- adjustable spring and the heavy brass camelback lever that was characteristic of early German telegraph keys. 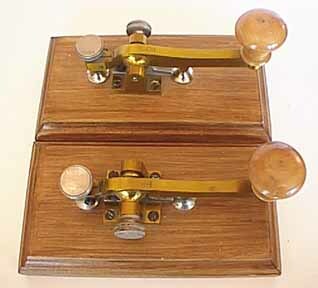 173 * LATER MATCHED GERMAN LAND-LINE CAMELBACK KEYS:(19KB) These two keys were mounted side-by-side on a single piece of wood. The keys are numbered 1 and 2. 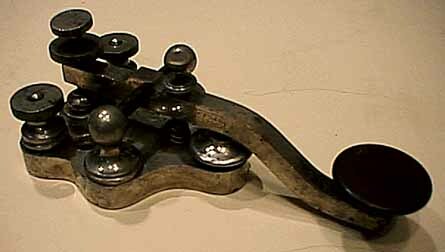 The heavy camelback levers are similar to those of early camelback keys but these keys were made around the turn of the century. 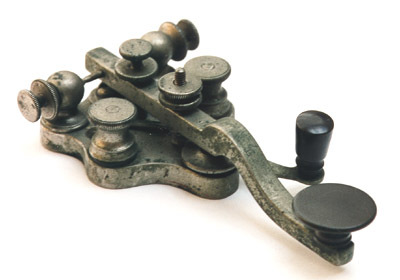 174 EARLY GERMAN LAND-LINE CAMELBACK KEY FROM CZECH REPUBLIC:(19KB) Nice early German camelback land-line key with the flat, non- adjustable spring and the heavy brass camelback lever that was characteristic of early German telegraph keys. This one was used in the Czech Republic. 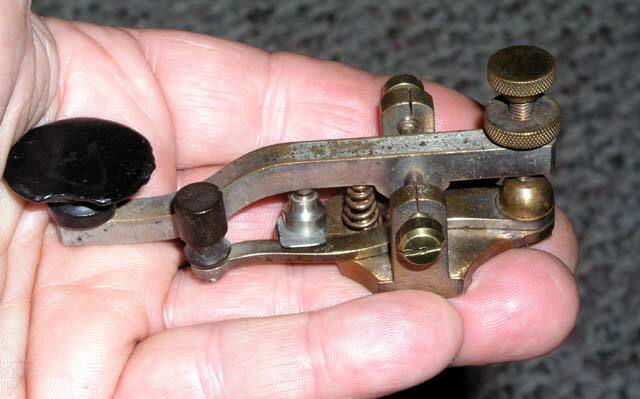 175 VERY EARLY GERMAN LAND-LINE FLAT SPRING PIVOT KEY:(18KB) Delicate key with flat spring/pivot (Like a Steiner key) at end of the 3-3/4" lever. 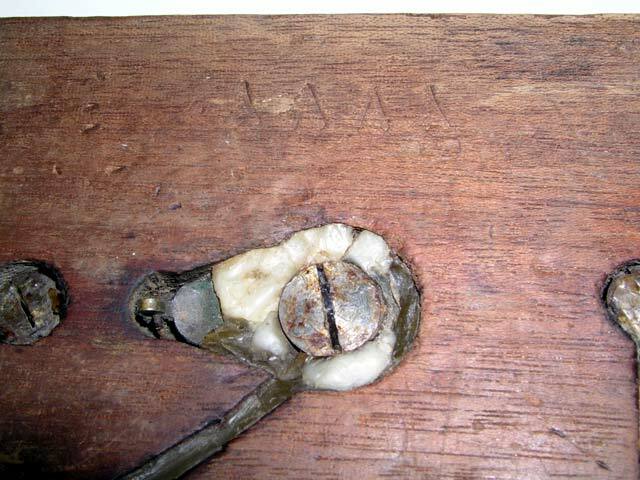 Early Ivory knob and normally open and normally closed contacts. Books show this to be circa 1840s. 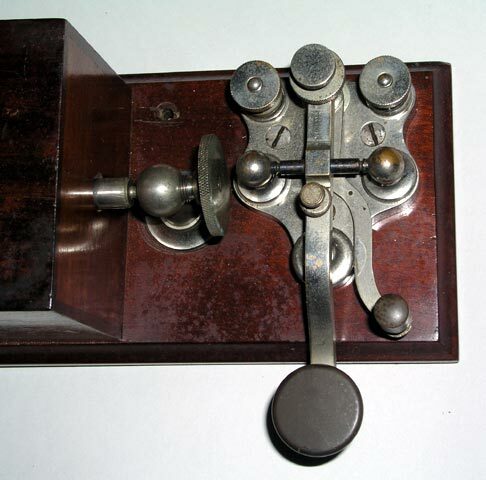 176 VERY EARLY GERMAN LAND-LINE SEMI-CAMELBACK FLAT SPRING KEY:(34KB)This is an early German land-line key with a very unusual lever design. 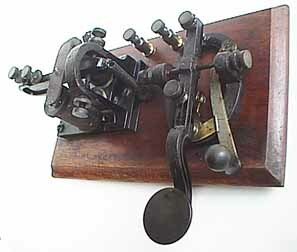 It uses the very early flat spring design to hold the lever up. 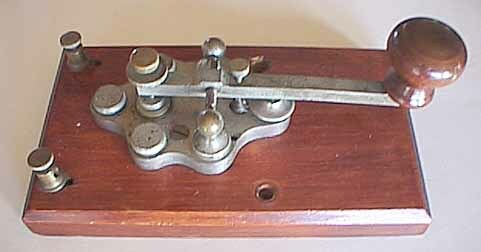 177 EARLY GERMAN LAND-LINE CAMELBACK KEY: Nice early German camelback land-line key with the flat, non- adjustable spring and the heavy brass camelback lever that was characteristic of early German telegraph keys. 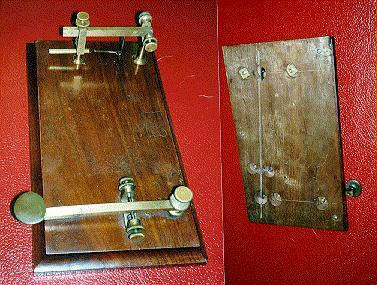 180 * EARLY FRENCH KEY, REGISTER, AND BELL PRACTICE SET:(17KB) This is an early French practice set consisting of a small telegraph key, an electrically operated bell, and a register which scribed impressions of dots and dashes into a moving paper tape. 181 EARLY GERMAN BRASS LEVER CAMELBACK PRACTICE KEY:(18KB) Small 3-3/4" brass lever with camelback curve and upward pointing end leading directly into knob. An early flat spring provides the tension. 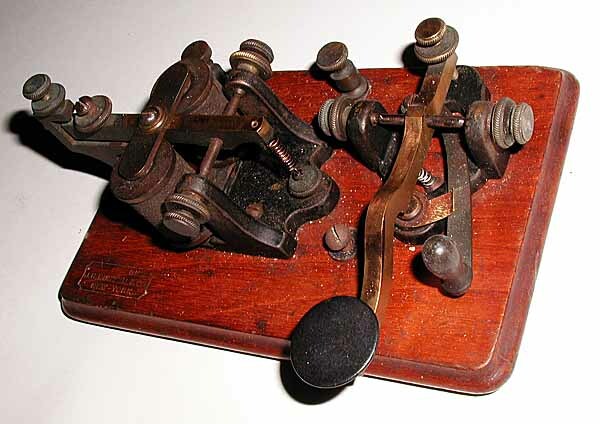 This design is typical of most of the early Prussian land-line keys. 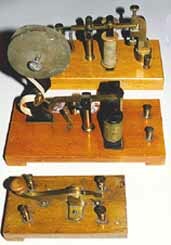 These keys were used with early German telegraph practice sets as shown below which are the German equivalent of the American Bunnell Camelback key and sounder practice sets. 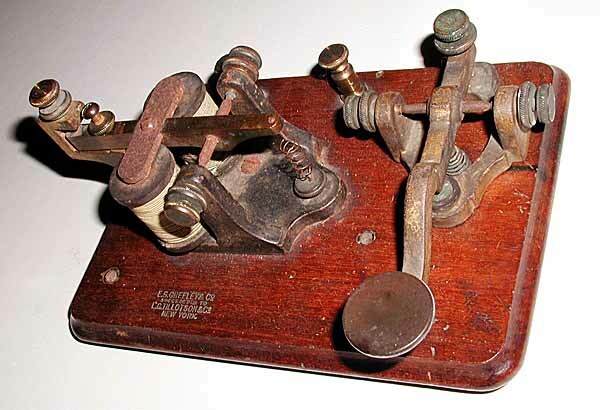 182 * EARLY GERMAN TELEGRAPH SET: KEY, REGISTER, RELAY:(13KB) This simple practice set is the German equivalent of the American Bunnell Camelback key and sounder practice sets. The simply-made key follows the classic lines of the earliest Prussian Camelback keys. 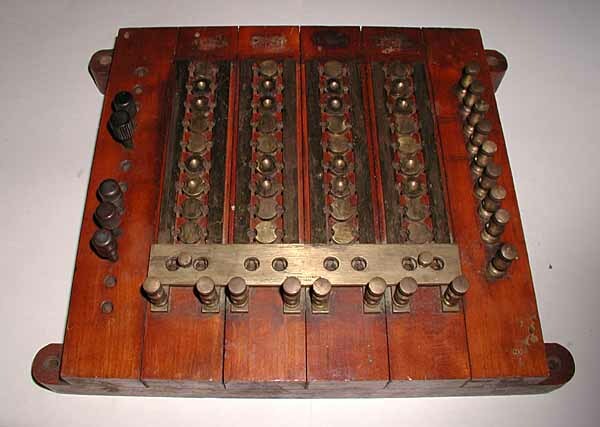 The register is also of very simple design. 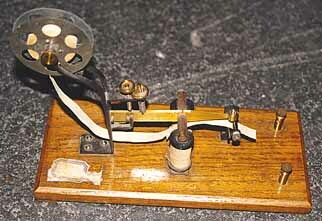 The paper tape is simply pulled through the register by hand. 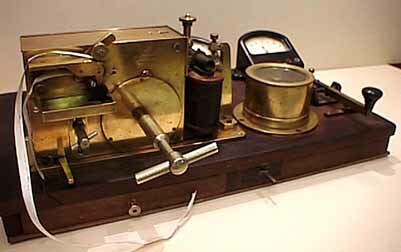 The relay, although simply made, is patterned after the earliest Prussian relays. 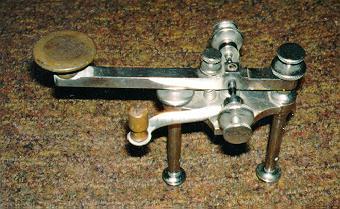 This is another variant of the very simple, hand-operated design. 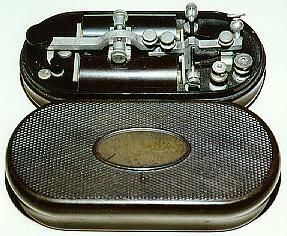 This illustration shows a box containing a complete German practice set consisting of 2 glass batteries, 2 keys, 2 registers, and 2 rolls of wire. The catalog was published in 1910/1911 by Edmund Prandstatter of Munich, Germany. 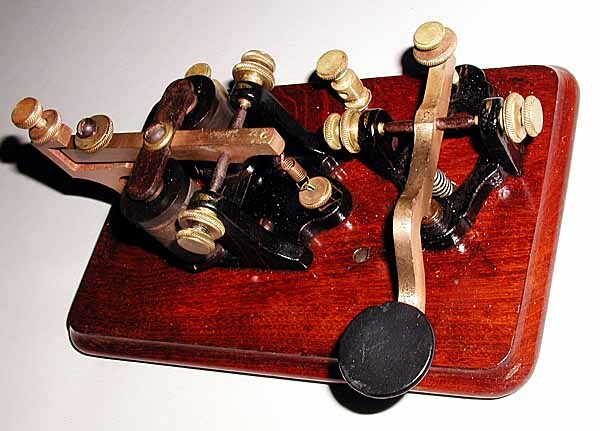 It is interesting to note that registers were still being produced and sold at this late date in Germany while Americans had abandonned registers in favor of copying code by ear from sounders around the 1860's. It is also interesting to note that there are NO sounders offered for sale anywhere in the catalog !! 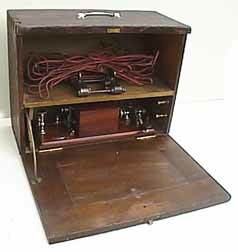 This practice set from the above catalog included a more complex spring-driven register which pulled the paper tape automatically. 183 VERY EARLY GERMAN CAST LEVER CAMELBACK KEY:(25KB) Massive 4-3/4" long cast lever with the classical Prussian camelback shape. An early flat spring provides the tension. Normally open contacts only. 185 UNUSUAL EARLY GERMAN CAMELBACK KEY:(15KB) Small 4-1/4"Camelback lever with unusual upward pointing end leading directly into knob. Key is pivoted on far end and has coil spring. Black 3-1/2x2-1/2 base stamped: E.ZIMMERMAN, LEIPZIG. 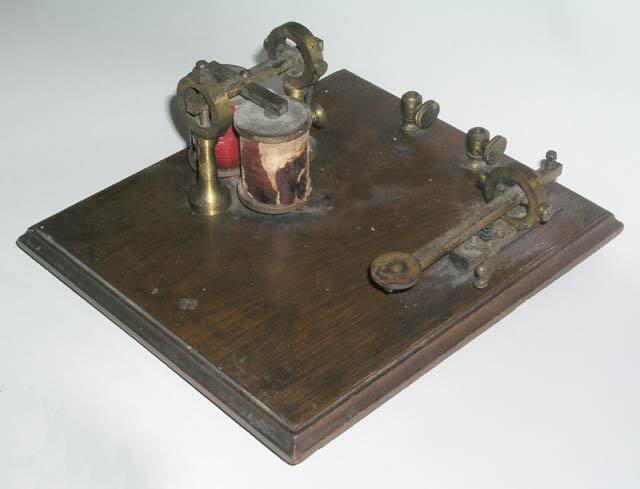 This key was sold for use in scientific experiments as well as for telegraph. 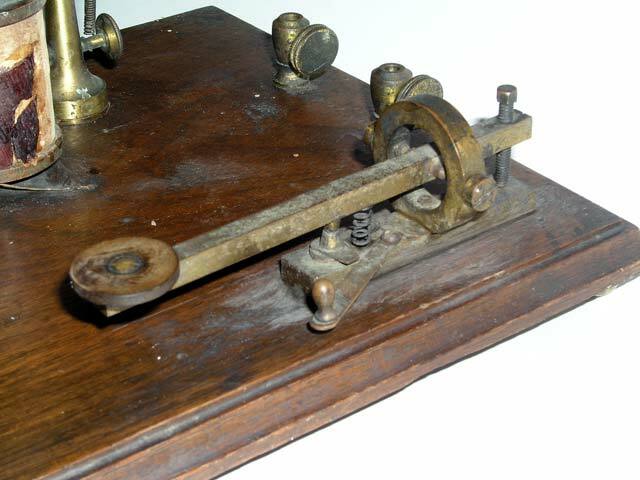 0187 EARLY GERMAN 'SIEMENS' KEY, REGISTER, & GALVANOMETER (KROB) SET:(16KB) This set is a typical example of an early European land-line telegraph system consisting of a straight-lever German key, an ink writing register, and a galvanometer for measuring the condition of the line. 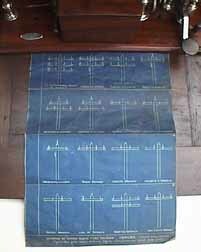 A roll of paper tape on which the dots and dashes were written (in ink) is stored in the drawer under the register. 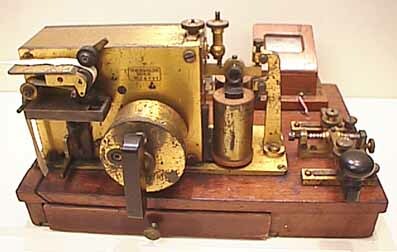 This set was manufactured by Siemens. 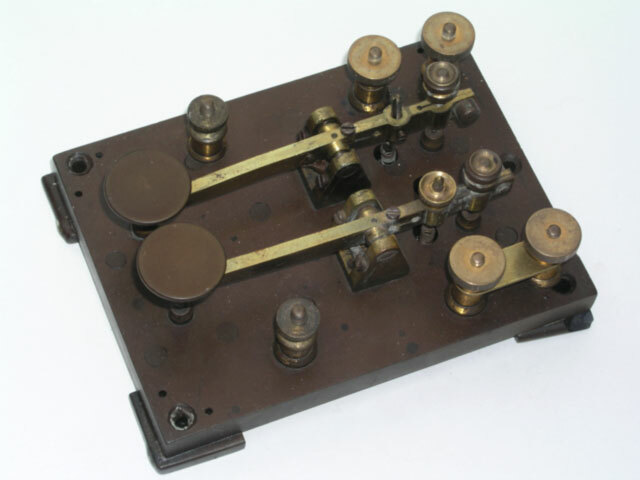 This set is a typical example of the early European land-line telegraph systems which consisted of a straight-lever German-design key, an ink writing register, and a galvanometer for measuring the condition of the line. 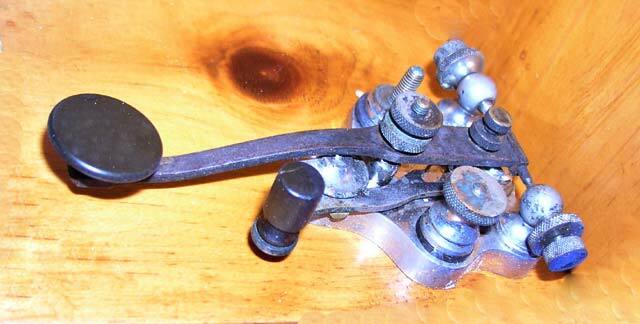 It is called a ''KROB'' set which stands for: Key and Register on Base. 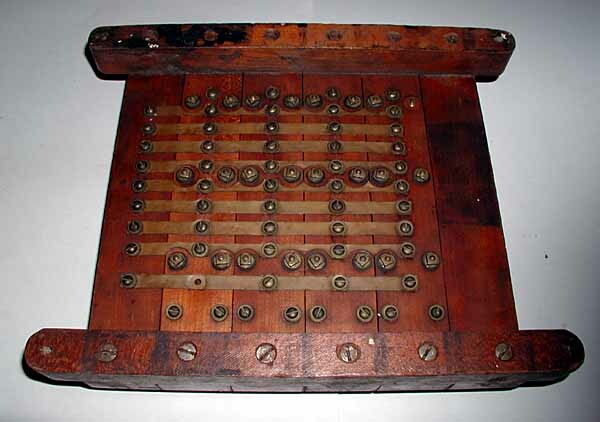 A roll of paper tape on which the dots and dashes were written (in ink) is stored in the drawer under the register. 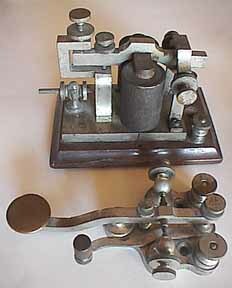 This set is stamped with the French manufacturer's name but the design of the key and register are clearly Siemens. 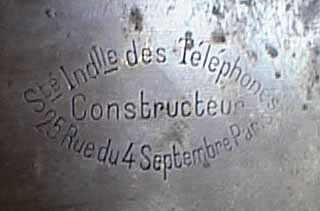 The name stamped on the set reads: Societe Industrielle des Telephones, 25 Rue du 4 Septembre, Paris. I believe that the set was probably originally manufactured or certaily licensed by Siemens. 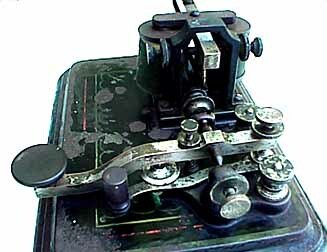 NOTE the interesting telegraph key which has the characteristic German Siemens spring-mounted lower contacts AND surprisingly, it has two tension springs. 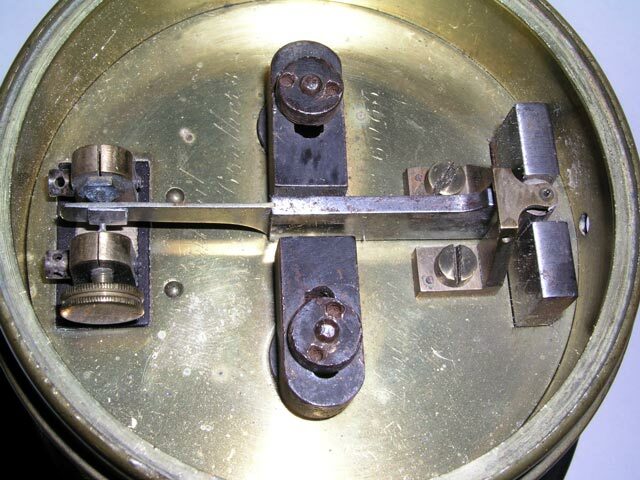 One spring is mounted in front of the trunnion and one spring is mounted in back of the trunnion. It is unclear why the spring in back of the trunnion was needed. 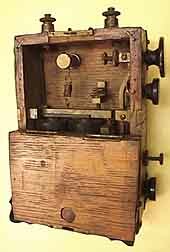 The only other two-spring key that I have been able to find is listed in the Spark and Radio keys' and the 'German Military keys' sections of this museum. The following views of this set allow you to see all of the important details. 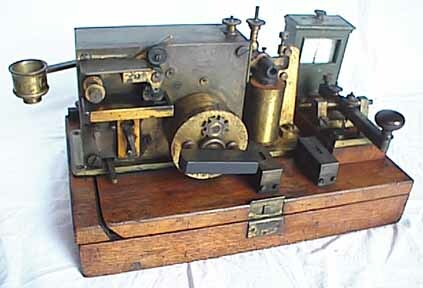 This set is a typical example of a land-line telegraph system consisting of a straight-lever German key, an ink writing register, and a galvanometer for measuring the condition of the line. This one is somewhat later than number 0187 and the black meters were probably added later than it's first date of manufacture. 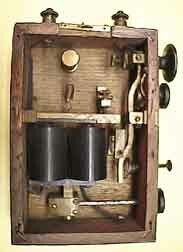 It was manufactured by H. Wetzer, Pfronten Bayern. 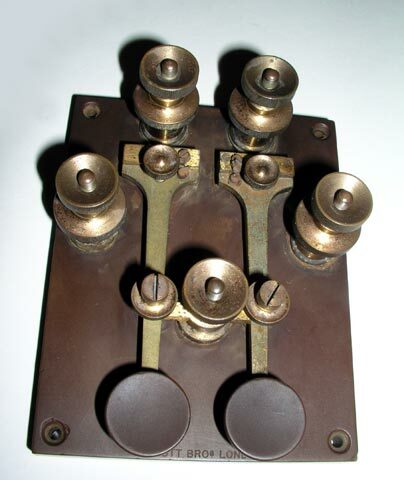 190 LARGE WESTERN UNION TRANSATLANTIC CABLE KEY:(51KB) Two large old brass levers mounted on a 4-1/2x6" black rubber base. 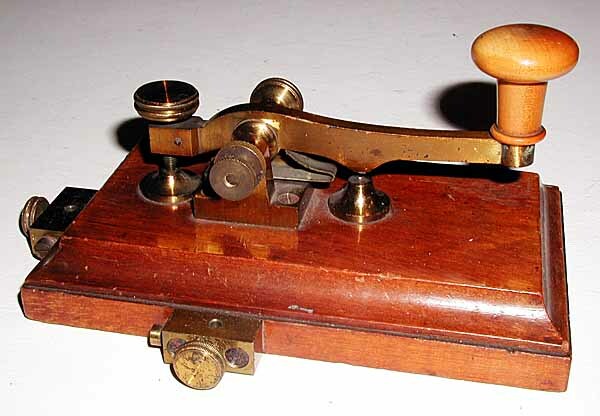 The left lever was used to send dots. Pressing it drove the cable voltage positive. 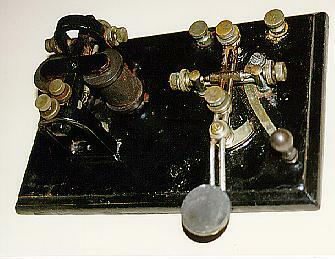 The right lever was used to send dashes and drove the cable negative. 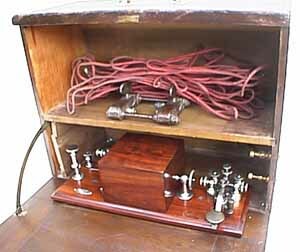 Since the cable was thousands of miles long, it acted as a huge capacitor and the full plus-to-minus voltage was necessary to help it discharge. 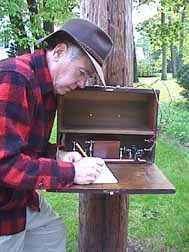 The messages were recorded on a moving paper strip and it took skill to visually tell the difference between dots & dashes. 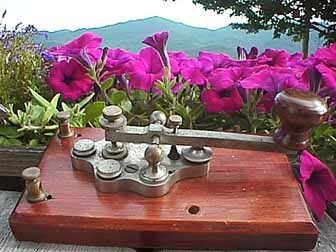 192 LARGE ELLIOTT BROTHERS TRANSATLANTIC CABLE KEY:(51KB)This is a very fine example of an early submarine cable key. 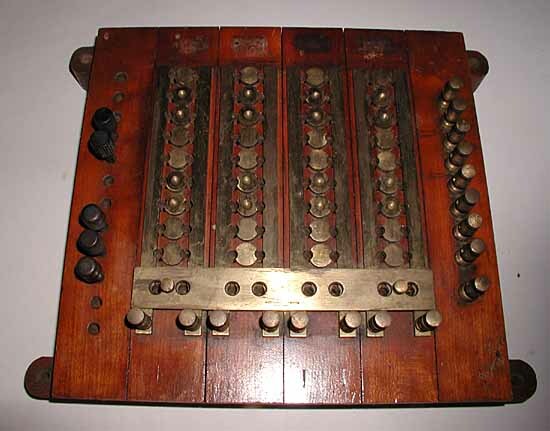 It has survived in very good condition and shows a plethora of adjustments that allow it to be set to the exact tension and spacing desired by an operator. 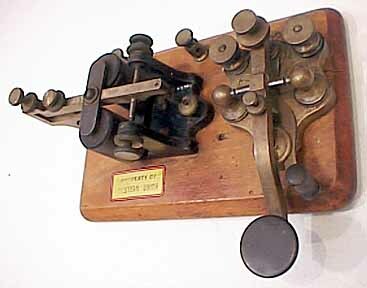 The left lever was used to send dots. Pressing it drove the cable voltage positive. 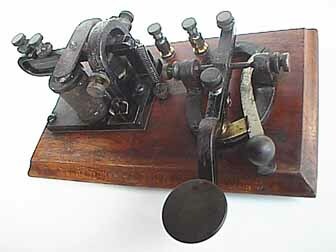 The right lever was used to send dashes and drove the cable negative. 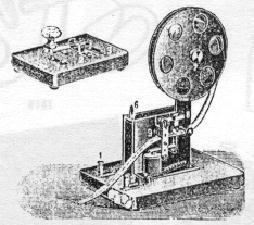 Since the cable was thousands of miles long, it acted as a huge capacitor and the full plus-to-minus voltage was necessary to help it discharge. 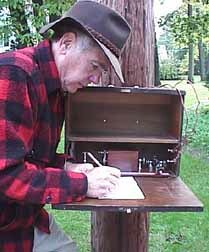 The cable messages were usually recorded on a moving paper strip and it took skill to visually tell the difference between dots & dashes. 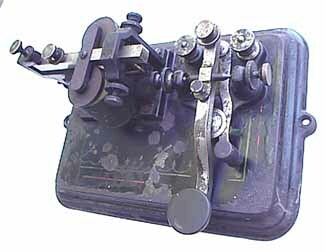 This key, however, was used with the super-sensitive relay shown below instead of the typical paper tape recorder. 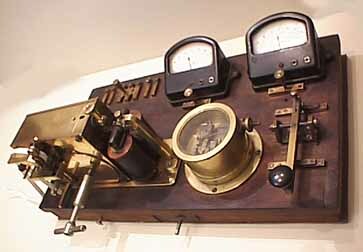 193 SUPER-SENSITIVE POLAR RELAY USED IN SUBMARINE TELEGRAPH CABLE LINES:(70KB)The electrical signals on a submarine telegraph cable were usually recorded on a moving paper tape and then translated into letters by eye. This relay has the extremely high resistance of 506 Ohms, making it sensitive enough to detect the very small voltage changes in a submarine cable. 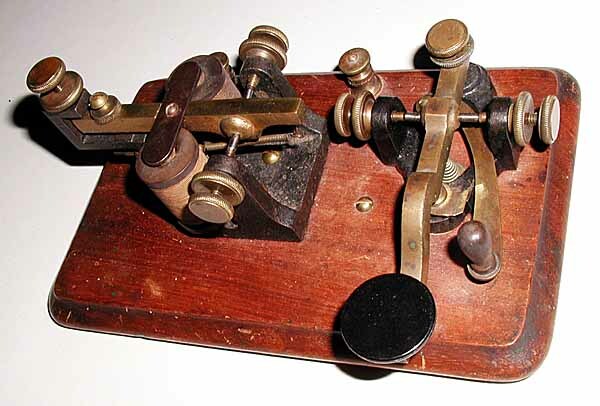 In addition, it has numerous very fine adjustments that allow it to be set to react to very weak signals such as thouse received over very long cables. 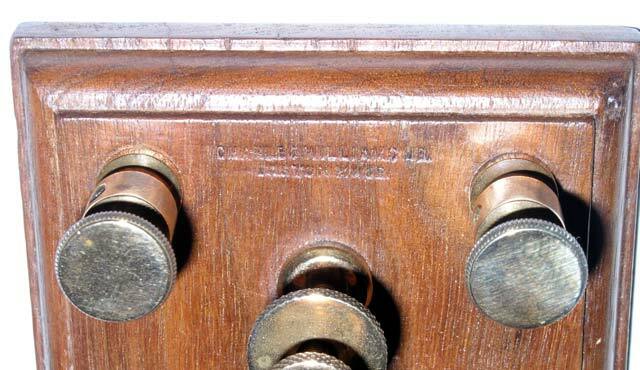 There is some engraved writing on the top of the relay but I have been unable to read it because it is not engraved deeply enough into the metal. 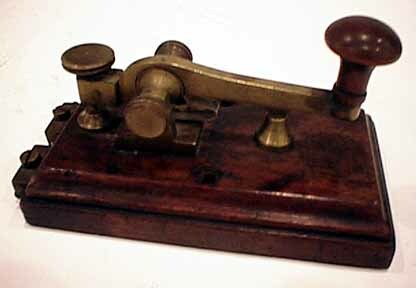 This relay was located along with the Elliott Brothers Submarine Telegraph Cable Key shown above and was probably also made by Elliott Brothers. 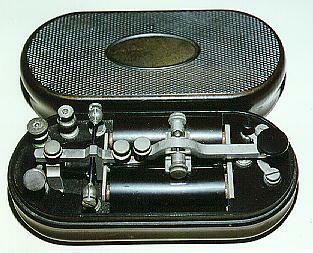 200 UNUSUAL ELLIOTT BROTHERS "UNIGRAPH" POCKET KEY AND SOUNDER: (20KB) This tiny set is carried in a small leather case. 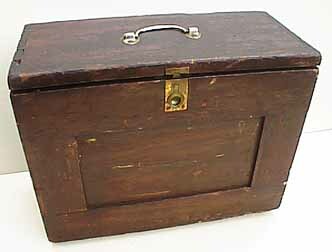 It consists of a 2 inch diameter brass cylinder 1-1/2 inch high. A tiny key protrudes from the side. 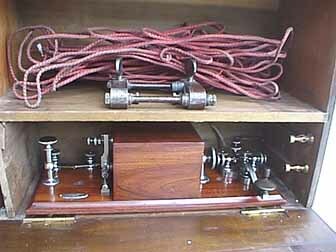 200b coils (22KB) are activated. 200c The top is engraved (30KB): The "Unigraph" Designed by T. A. Bullock and A. C. Brown Elliott Bros., London. No 125. 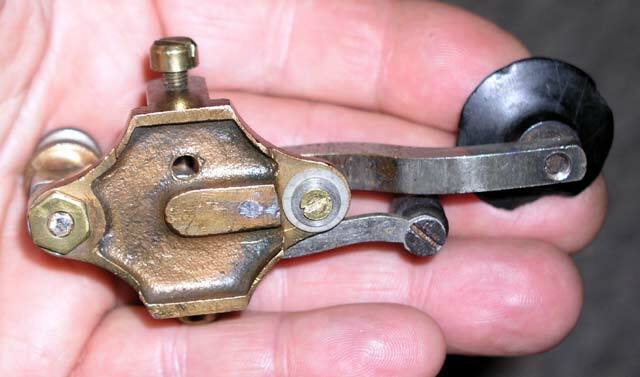 201 * UNUSUAL MINIATURE BRITISH STRAIGHT LEVER KEY: (13KB) This miniature key was probably made by Elliott Brothers. 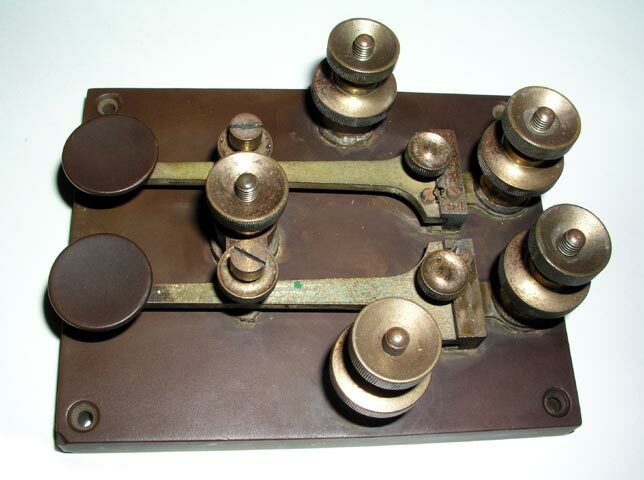 203 WESTERN ELECTRIC LINEMAN'S POCKET TEST SET:(27KB) Similar to #205 but tiny camelback-style key has lever stamped Western Electric Co. Chicago. 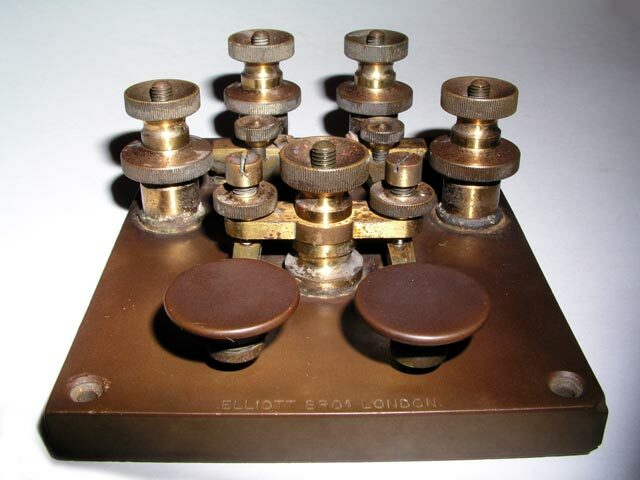 205 TILLOTSON LINEMAN'S POCKET TEST SET:(50KB) These hard-to-find sets were used by early linesmen and Civil War telegraph operators and spies to carry to the top of telegraph poles & tap into the telegraph lines for testing, espionage, and sending/receiving messages. Consists of a lovely oval hard rubber case with engraved top 4-1/2" long by 2" wide. 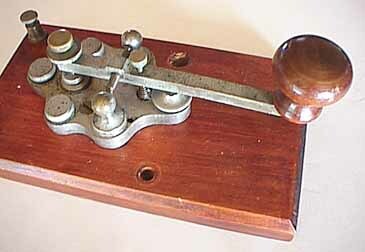 Inside is a tiny key with 1-1/2" lever and a sounder with sensitive horizontally mounted coils. 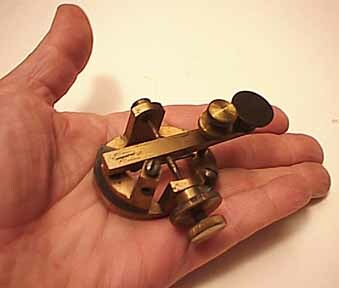 206 BUNNELL LINEMAN'S POCKET TEST SET:(34KB) Tiny sounder integrated with tiny key on black base. 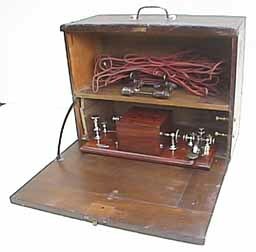 210 POSTAL TELEGRAPH COMPANY POCKET TEST SET:(13KB) This very small set was made by The Postal Telegraph Company and used by the military in the Spanish-American war and others. 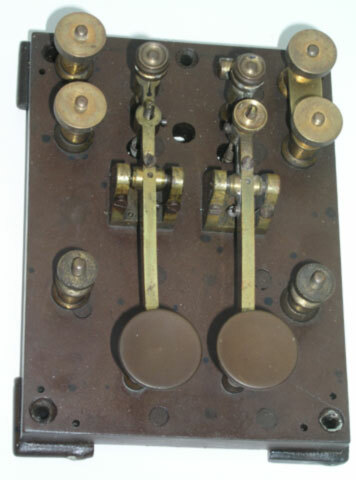 210a Opening the cover reveals the key mechanism:(13KB) and the sounder armiture. 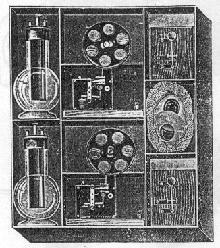 210b The removal of the entire front cover:(12KB) shows the coils for the sounder and the "Skirrow patented" rack-and-pinnion device that adjusts the coil-to-armiture distance. 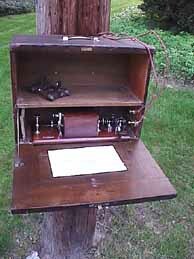 Very similar portable telegraph offices were carried in Fire Chiefs' buggies in major city fire departments to allow communications during major fires. 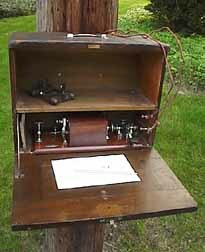 A pole-mounted tent was often used to protect the equipment and telegrapher from the elements in bad weather. 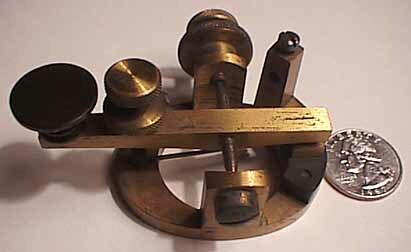 217 * VERY SMALL EARLY BRASS LEG KEY:(15KB) A tiny brass leg key with heavy lever and pressed-in steel trunnion. 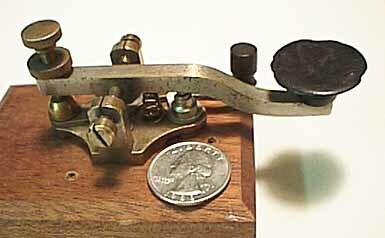 218 VERY SMALL EARLY NICKEL-PLATED BRASS LEG KEY:(43KB) A tiny nickel-plated brass leg key with a heavy lever and a pressed-in steel trunnion. 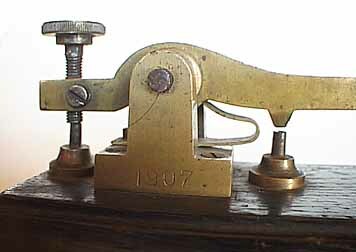 220 GRAY & BARTON LEG KEY:(24KB) Lovely very early square brass lever bent down slightly toward knob and stamped "GRAY & BARTON, CHICAGO". Trunnion is nicely machined steel held in place by a setscrew. 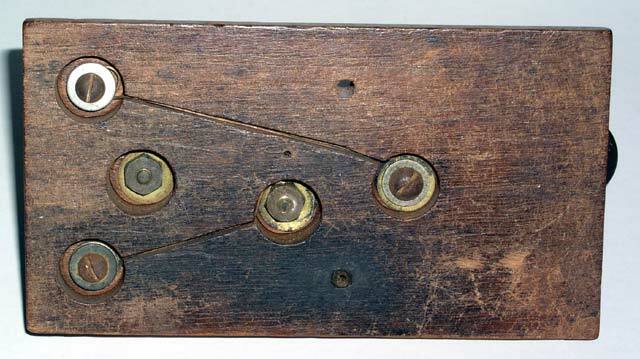 Very early design with no spring adjusting screw (a refinement invented by Phelps in the 1860s). 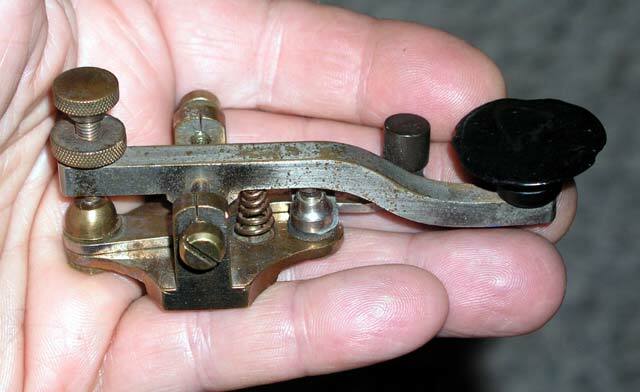 Short brass shorting lever pivoted under trunnion. 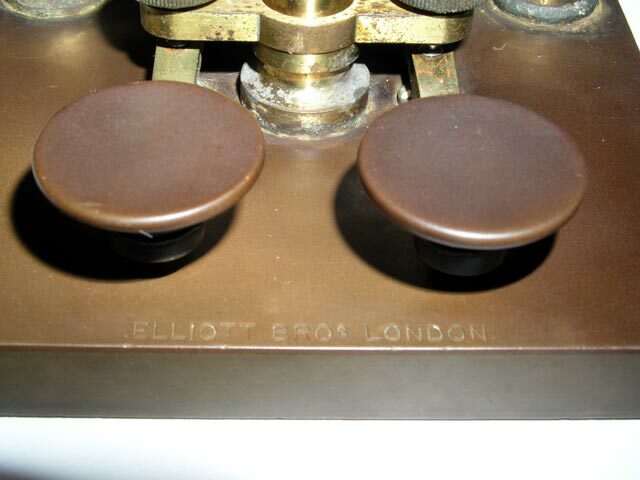 Cast brass base stamped "828". 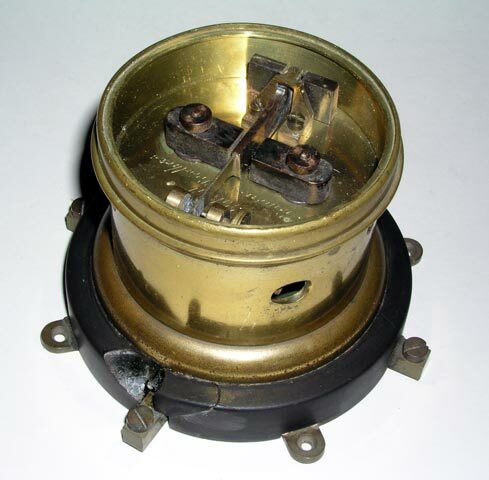 2 tapered SMOOTH brass legs extend down 2" & end in brass-screw wire binding posts. ca. 1860s. 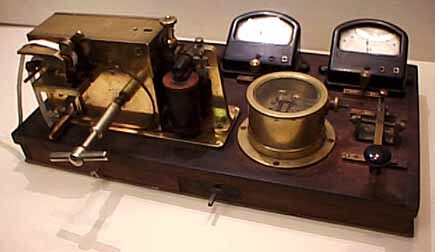 221 R. HENNING "MAKER" SOUNDER:(38KB) Very early all brass sounder used with 220 above. 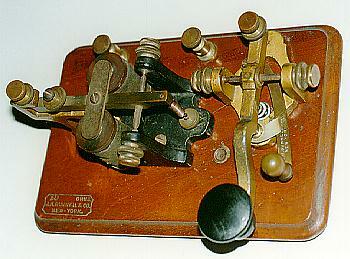 armiture stamped R.HENNING, MAKER on side & W.U.TEL.CO on top. 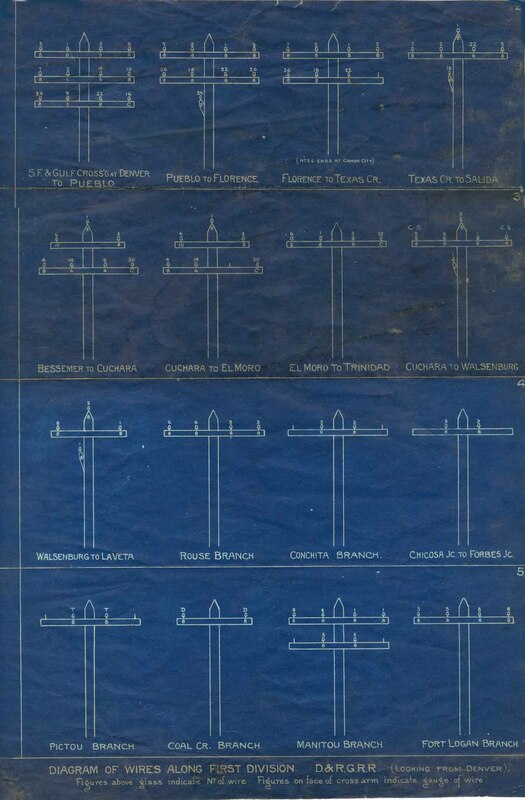 Very early design. 221a * R. HENNING "MAKER" SOUNDER: As above. Traded to Roger Reinke. 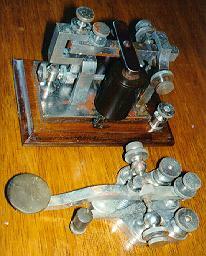 222 Western Union / Grey & Barton Key:(24KB) Same as 220 with Nickel-plated lever, unstamped,base stamped"416". Spring adj screw. ca. 1860s. 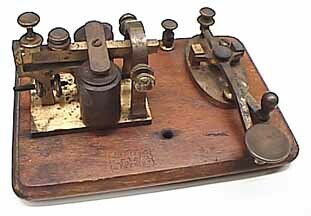 224a Partrick & Carter step-lever key with a lovely brass arch over the trunnion:(55KB). 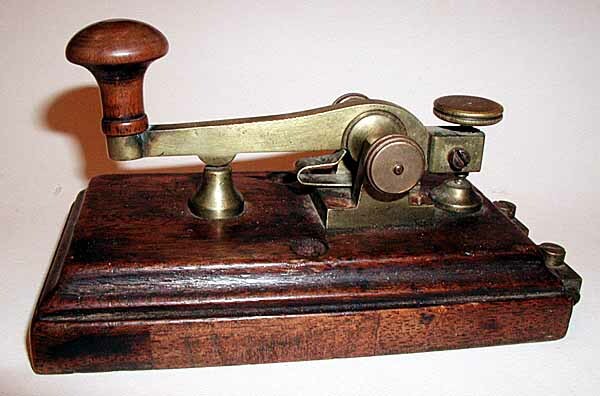 225 BRASS STEP-LEVER KEY & SOUNDER ON WOODEN BASE:(32KB) Masive brass lever key with steel shaft, japanned base, and early step-down lever design on wooden base with Black Japanned base sounder with gold lettering "PATENTED FERY 16,1875". 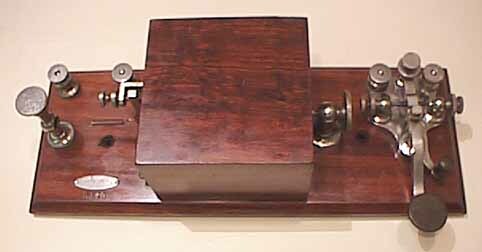 227 CLASSIC LEWIS PATENT KEY: (36KB) This is one of the more frequently seen versions of the Lewis Key which is the only key that was granted a patent exclusively based on the beautiful design of the key rather than any innovative electrical or mechanical attributes. 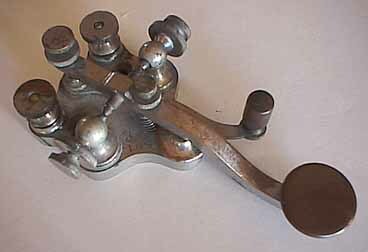 228 VERY UNUSUAL FLAT-LEVER LEWIS PATENT KEY: (33KB) This is one of the most unusual Lewis keys. 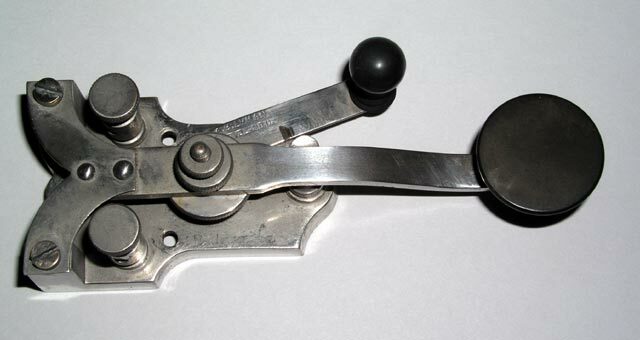 It has a flat steel lever instead of a nickel-plated brass lever and the pivot points are at the far end of the lever. 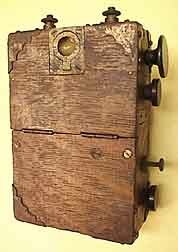 229 MINIATURE LEWIS KEY BOX RELAY/SOUNDER: (38KB) This is an unusually small so-called box relay with a boxed sounder/relay and a lewis key on a wooden base. It is not clear why it was made in such a small size. 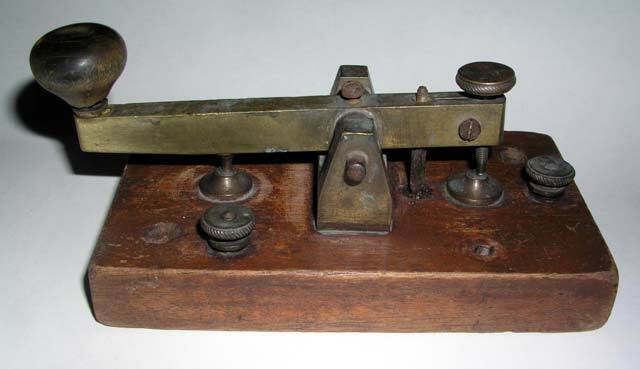 230 LEWIS / WESTERN UNION TELEGRAPH SET:(25KB) This unusual set consists of a lovely brass LEWIS key mounted perpendicularly across a 12inch long wooden base which is mounted on a gold pin striped black cast iron base. 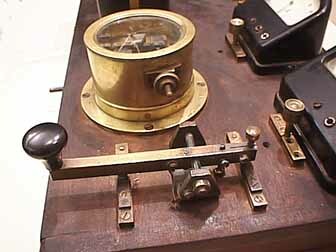 To the left of the LEWIS key is an unusual sounder and to the right of the LEWIS key is a line relay of unusual design. 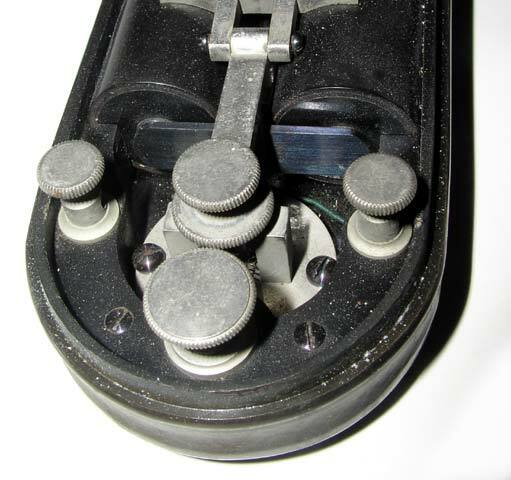 The adjusting string/spring for the relay passes over the top of the LEWIS key from right to left to an adjusting knob. The relay is engraved W.U. TEL. 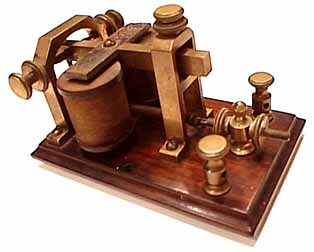 CO. on the brass base and OHMS 153 on one brown coil cover. 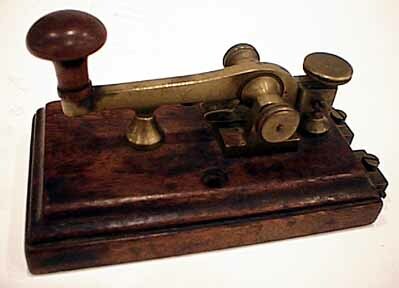 The key is engraved "LEWIS PAT May 25, 1875 May 23, 1876 on top of the lever and "W. E. MFG. CO. CHICAGO" on the side of the lever. Bottom of base signed in ink: J.F. Putnam, July 10/80. 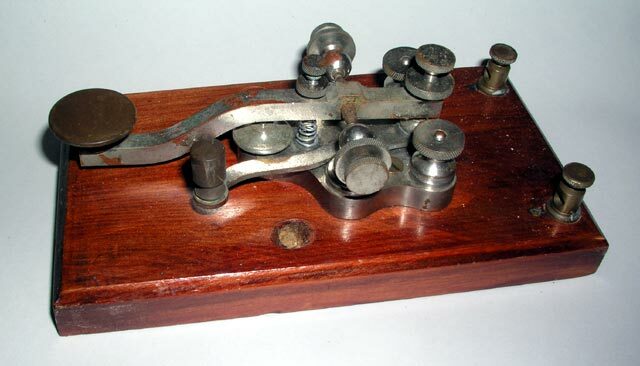 232 EXTREMELY UNUSUAL STRAIGHT LEVER FLAT TERMINAL LEWIS KEY:(16KB) This is the strangest Lewis Key that I have ever seen. 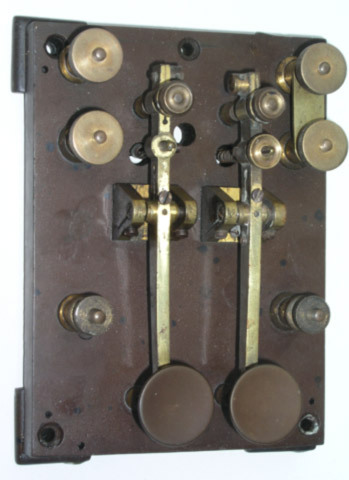 The lever is nearly straight which is unusual for Lewis keys but the most unusual aspect of the key is the three flat-topped terminals which, as you can see from the underside view connect to the normally open, normally closed, and frame of the key. There is no way to connect wires to these terminals directly so I can only assume that the key was slid into some sort of spring loaded contact assembly. I have included several different views of the key. 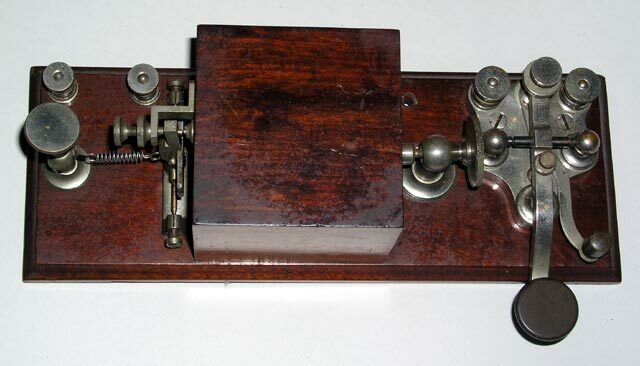 233 ** EXTREMELY UNUSUAL LEWIS CAMELBACK KEY:(21KB) This is a very unusual Lewis patent key with a camelback lever. 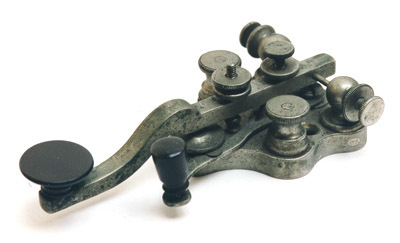 Most Lewis keys have a gently sloping lever which paved the way for virtually all subsequent key designs. 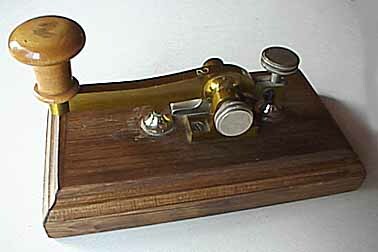 This key is owned by collector: Gray Marshall KQ6MW..
234 LEWIS KEY: (15KB) This is one of the more frequently seen versions of the Lewis Key. It is described more fully in the write-up of the key below. 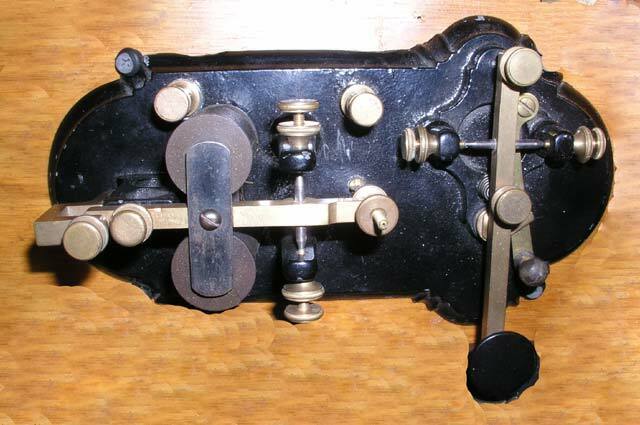 235 LEWIS KEY: (78KB) This all-plated Lewis key is an example of the early Lewis designs which did not include adjustments for side-play in the trunnion. 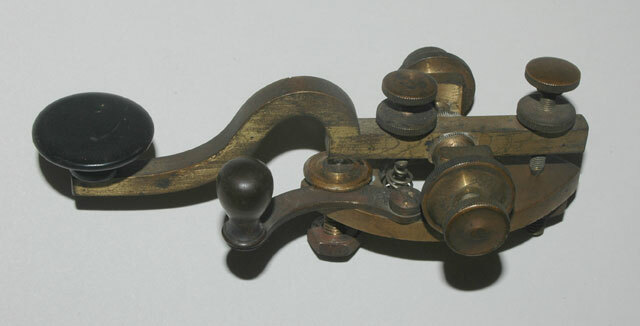 The Lewis key patents referred to the unique and ornate design of the key rather than any distinguishing mechanical attributes. Stamped: LEWIS PAT. 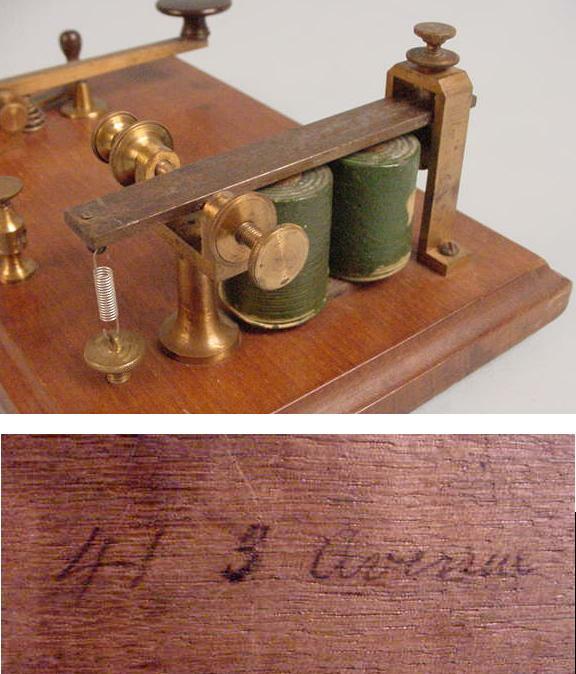 May 25, 1875, May 23, 1876 on top of lever and W.E.MFG CO. Chicago on side of lever.. ROTATING VIEW OF #235 LEWIS KEY: (202KB) This is a VERY LARGE FILE that takes a long time to load but it results in a view of a rotating Lewis Key. It is an experiment to see whether it would be a practical way to show many sides of the same key. 236 RAILROAD LEWIS KEY AND LEWIS CAMELBACK SOUNDER:(14KB) This is a classic Lewis Key with an unusual Lewis Camelback Sounder. 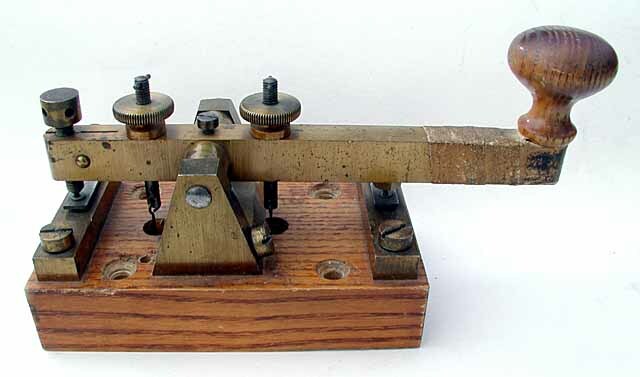 The Key and Sounder were apparently used on the railroad because each is marked NPRR. 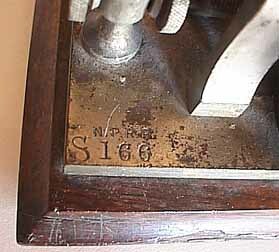 The key is marked J-165 and the Sounder is marked J-166. I have included several different views of the set. 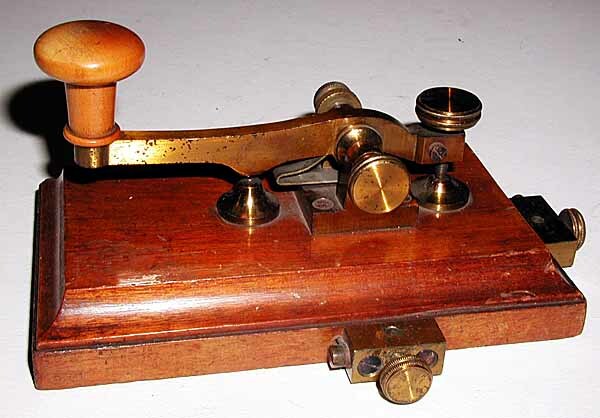 237 LEWIS KEY AND SOUNDER:(16KB) Lewis key like 0235 with hard-to-find Lewis sounder. 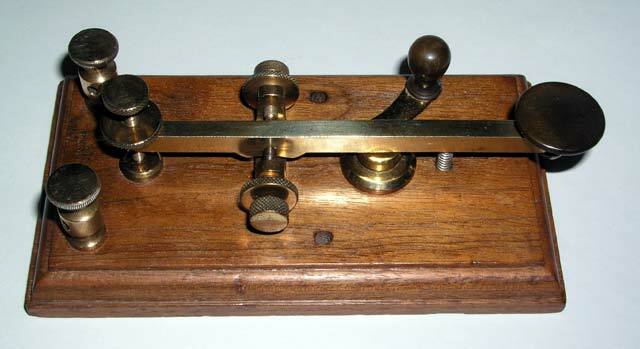 239 LEWIS KEY KOB:(17KB) This is an all brass Lewis Key mounted on a wooden base with an early horizontal spring sounder. 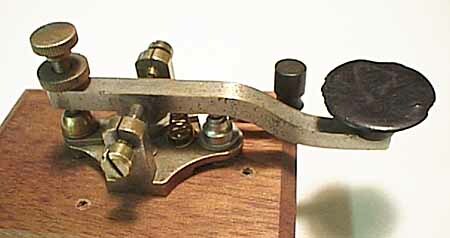 240 EARLY LYMAN PATENT KEY: (19KB) This key shows the unique Lyman patent design with the lever suspended by a "y" shaped piece of spring steel. 240e UNUSUAL AND EARLY NICKEL PLATED LYMAN PATENT KEY:(26KB) This is the first Nickel plated Lyman key that I have seen. 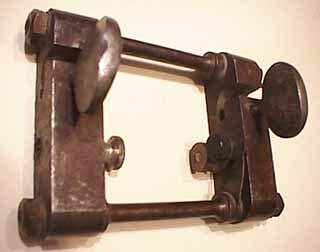 It shows the unique Lyman patent design with the lever suspended by a "y" shaped piece of spring steel. 241 EARLY NICKEL-PLATED VICTOR PATENT LEGLESS KEY:(27KB) This lovely nickel-plated brass key shows the "Victor patent" knife-edge bearings. 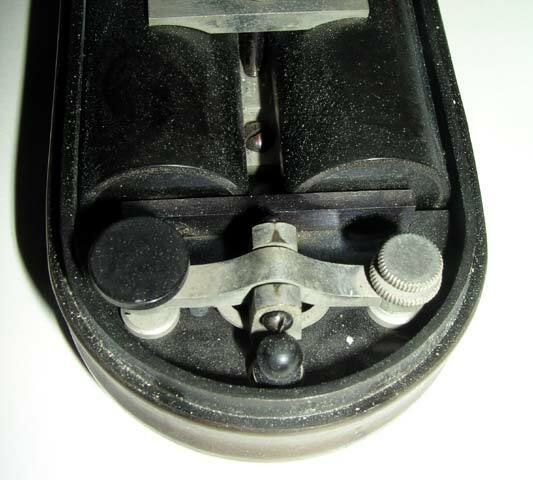 Rather than using a pinnion shaft, the key pivots on a knife- edge. 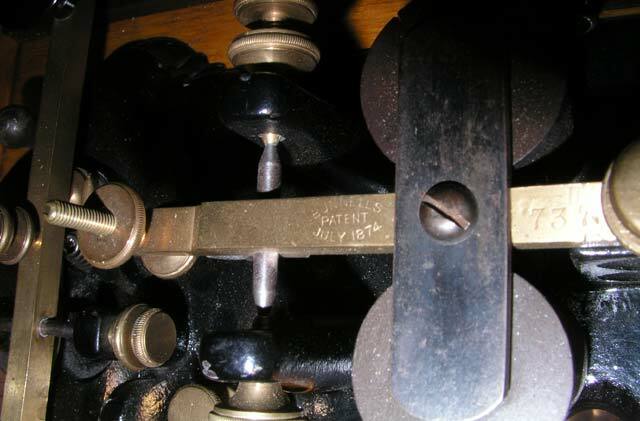 243 * VICTOR PATENT LEG KEY:(17KB) This lovely brass key shows the "Victor patent" knife-edge bearings. 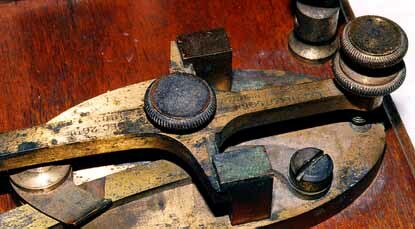 Rather than a pinnion shaft, the key pivots on a knife-edge. 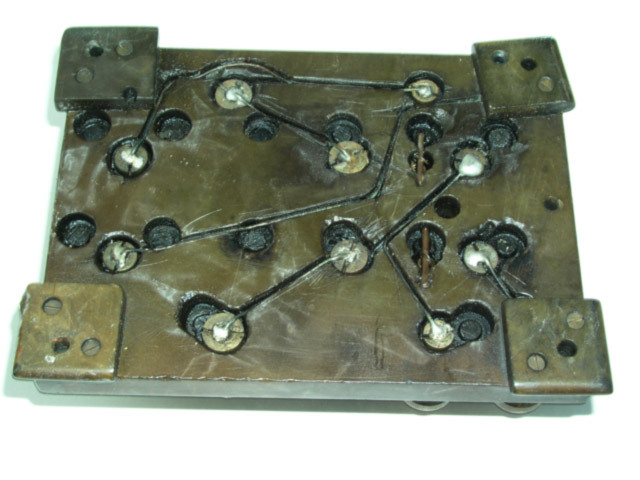 The legs attach the key to the operating table and also provide connections for the electrical wires. 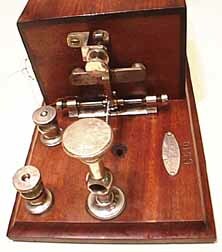 245 * TILLOTSON KOB WITH TILLOTSON-VICTOR KEY:(17KB) This lovely brass key shows the "Victor patent" knife-edge bearings. It is stamped: Pats Dec 26, 1882. 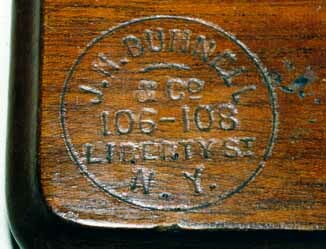 Both are stamped: L.G.Tillotson, 5 & 7 Dey St. New York. The base is stamped: 20 Ohms, L.C.T. & co. 8 Dey St.,N.Y. 248 * TILLOTSON CAMELBACK KOB:(15KB) This is a nice example of a Tillotson Camelback KOB. I have included several different views of the set. 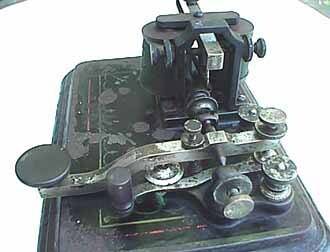 250 GREELEY / TILLOTSON CAST-LEVER CAMELBACK KOB:(43KB) 'KOB' stands for 'Key (and sounder) on base'. Gold-painted early camelback key with cast iron lever, shorting switch & matching sounder on wooden base which is engraved E.S.GREELEY & Co. Successors to L.G.TILLOTSON & Co. New York. Too early for spring adjusting screws. 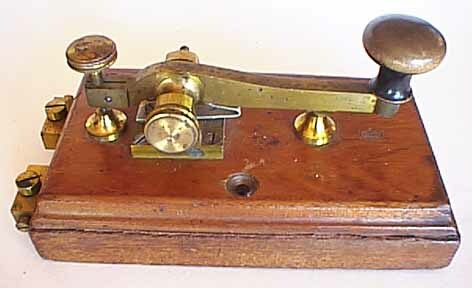 250aa GREELEY / TILLOTSON BRASS-LEVER CAMELBACK KOB:(41KB)Early camelback key with brass lever, shorting switch & matching sounder on wooden base which is engraved E.S.GREELEY & Co. Successors to L.G.TILLOTSON & Co. New York. Too early for spring adjusting screws. 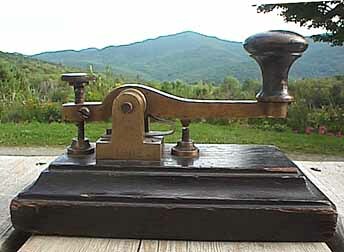 251 * BUNNELL CAST-LEVER CAMELBACK KOB:(40KB) Made by Bunnell around 1860s. Cast-Iron Lever Camelback Key originally painted gold to look like brass. Like number 250 above on unmarked base. 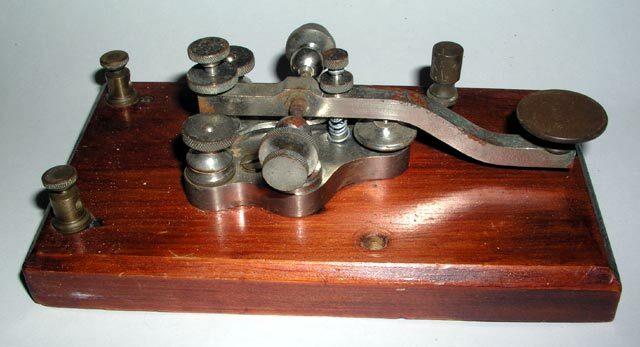 252a * BUNNELL CAST-LEVER CAMELBACK KOB:(27KB) As above on base stamped 20 ohms. J. H. Bunnell. 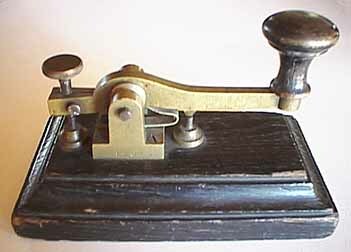 254 BUNNELL CAMELBACK KOB:(42KB) Made by Bunnell around 1860s. 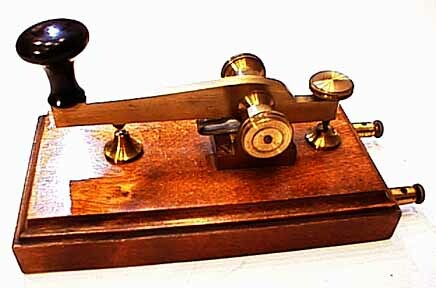 Like 252a above with black-painted camelback key mounted on unmarked base. 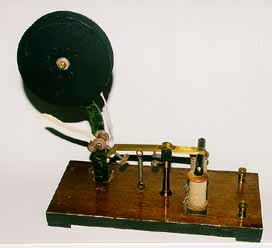 The sounder is mounted on a large thin brass plate. 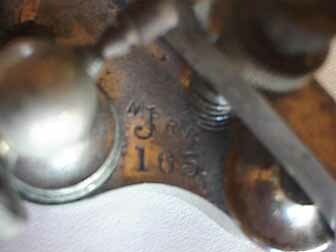 An interesting spring-adjusting screw was added by a railroad operator in 1945. 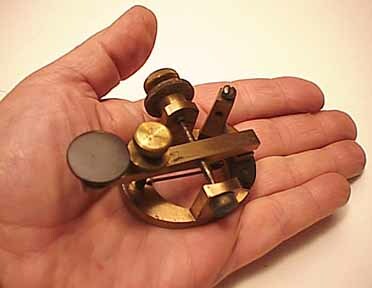 259 * MINIATURE CAMELBACK KOB:(50KB) About 3/4 size mini cast-iron-lever camelback key & small sounder on wooden base. No identification but all painted black with fine gold flower patterns on key & sounder.Too early for spring adj screw. 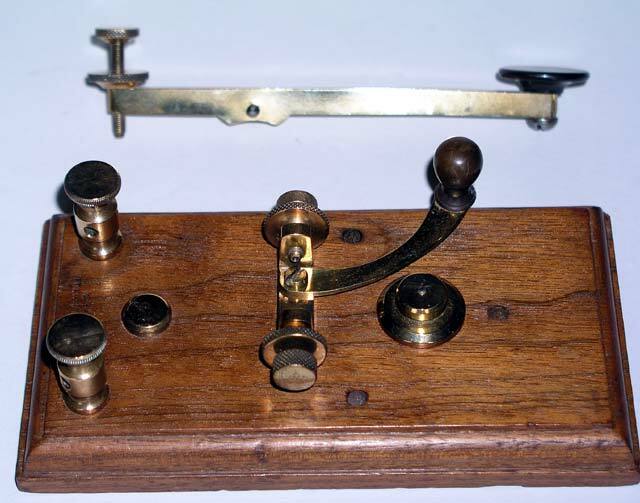 260 BUNNELL BRASS-LEVER CAMELBACK KOB:(73KB) Early brass lever camelback key with steel trunnion and shorting switch and black and gold painted sounder on wood base stamped 20 Ohms, J.H.Bunnell & Co., New York. 261 BUNNELL BRASS-LEVER CAMELBACK KOB:(44KB) Early brass lever camelback key with steel trunnion and shorting switch and black and gold painted sounder on unmarked wood base. 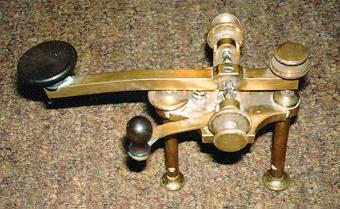 264 * REDDING BRASS-LEVER CAMELBACK KEY KOB. As above. No patent date or shorting switch. 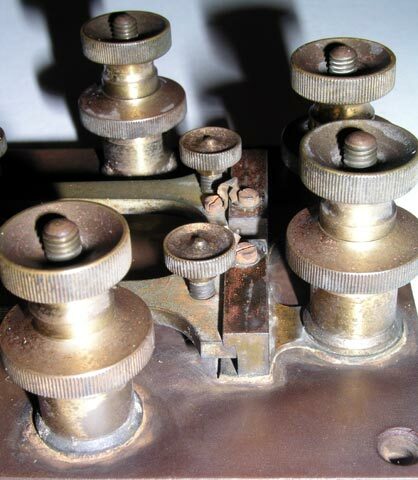 266 EARLY UNKNOWN BRASS-LEVER CAMELBACK-KEY KOB:(41KB) Brass-lever camelback key with steel trunnion shaft, no spring adjusting screw, & brass shorting lever. 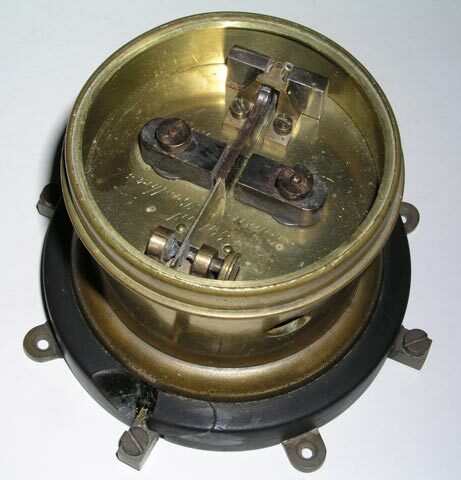 All cast iron sounder. 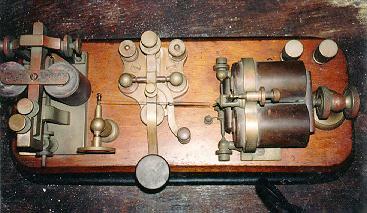 Both key and sounder have unusual bulges where trunnion shafts pass through. This is probably a Redding as above. 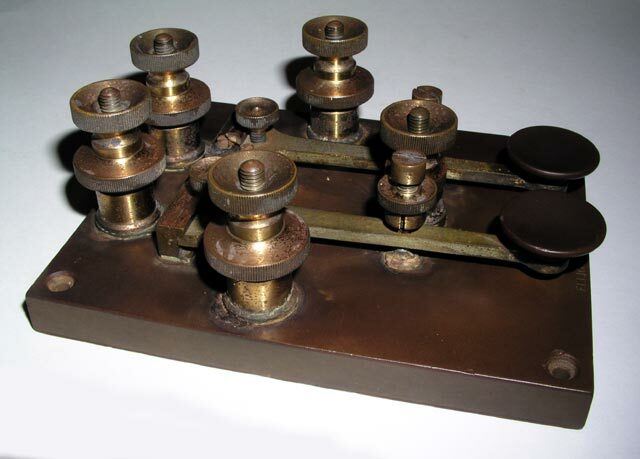 270 EARLY CAST-BASE TILLOTSON STRAIGHT-LEVER KEY PRIVATE-LINE KOB:(47KB)This private line KOB has a brass Key with a straight brass lever, steel trunnion shaft, spring adjusting screw, and brass shorting lever. 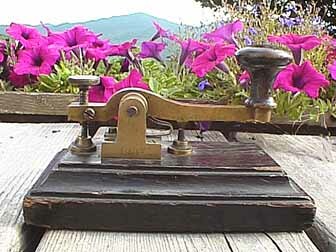 The base is very heavy cast iron with a sounder stamped "BUNNELLS PATENT JULY 1874 No737" on the heavy brass armiture. These sets were often used in private residences in the 1870's. 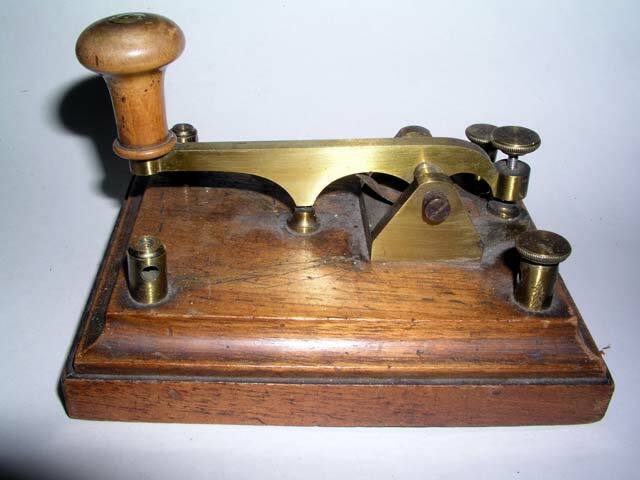 271 * CAST-BASE WESTERN ELECTRIC PRIVATE-LINE KOB:(23KB> Black cast-iron base with the Western Electric key that has two parallel rods as its lever. 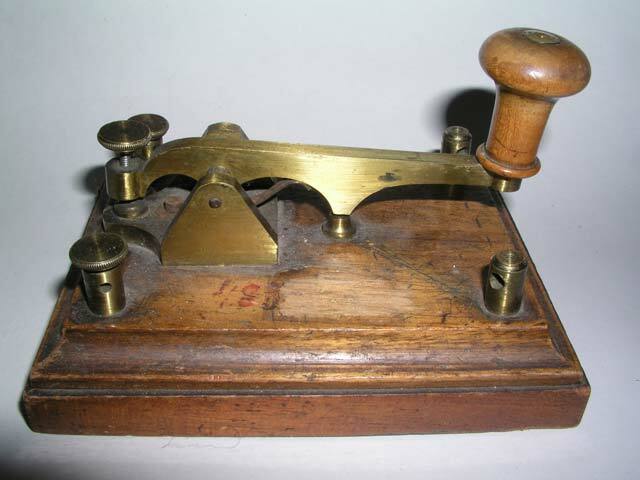 271#2 CAST-BASE WESTERN ELECTRIC PRIVATE-LINE KOB:(20KB)Identical to number 271. 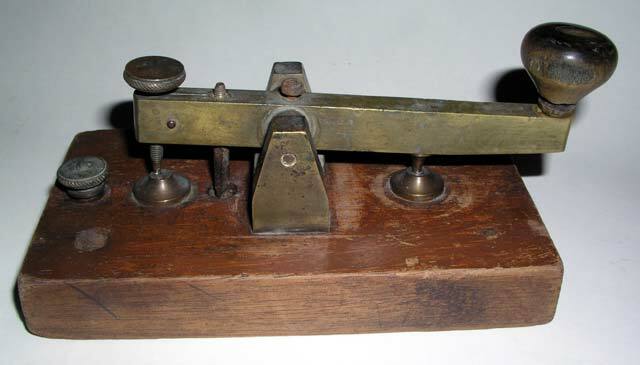 272 VERY EARLY L.G.TILLOTSON ALL BRASS KEY AND "APRIL-FOOL" SOUNDER KOB:(59KB) The key is a straight brass lever stamped L.G.TILLOTSON, 8 Dey St., New York. 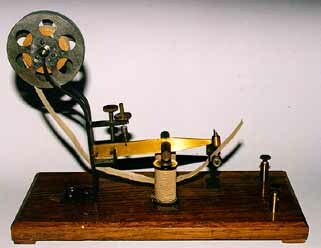 with no spring adjusting screw and a steel trunnion The sounder has two coils in line from front to back but the armiture is pivoted at the top center of one of the coils which can't possibly make any contribution to the operation of the sounder. (Did they not know this?) Sounder armiture stamped Patent App'd For. 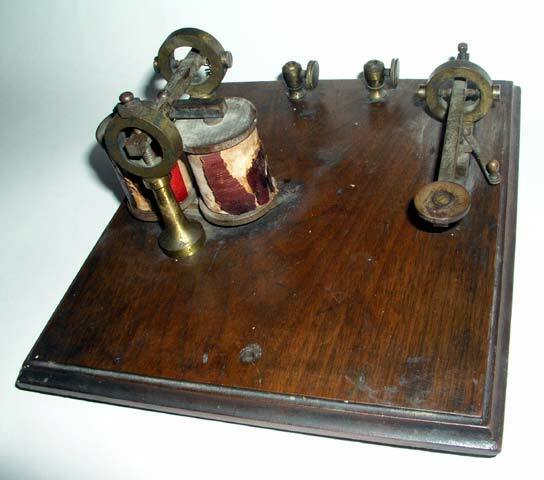 Wooden base stamped 6 Ohms, L.G.T. 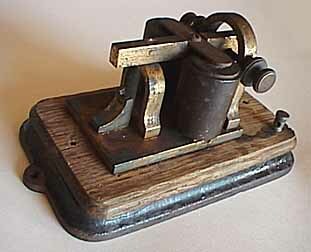 & Co. 8 Dey St. N.Y. Patented June 24, 1873. 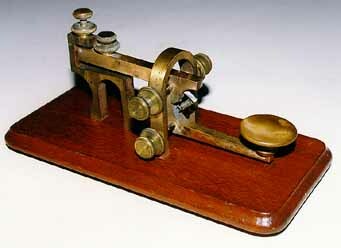 273 ** VERY EARLY L.G.TILLOTSON ALL BRASS KEY AND REDESIGNED SOUNDER KOB:(46KB)This set appears to have been designed after Tillotson realized the error in the design of the ''April-Fool'' sounder shown above in item 272. 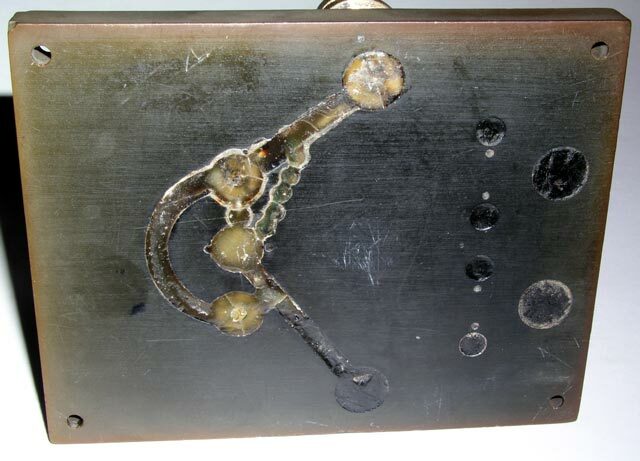 The sounder now has both of the magnet coils pulling on the armiture. 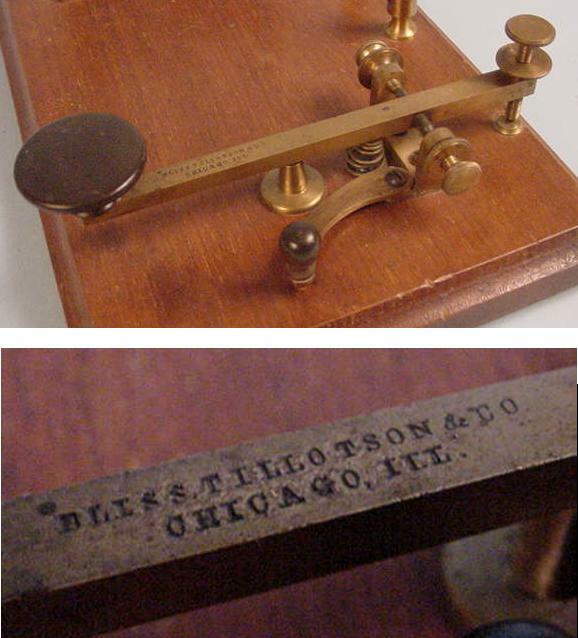 This set is labeled BLISS TILLOTSON and a pencilled-in address on the bottom shows that it was manufactured at 54 South 4th Street in Philadelphia where the company moved in 1874 which was the year after the above set was patented. 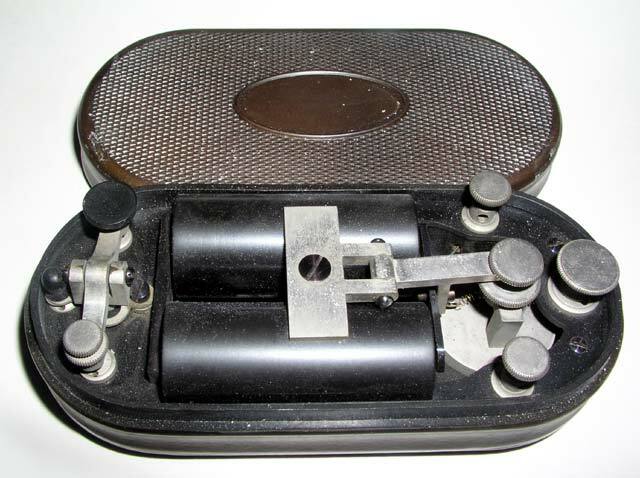 274 UNUSUAL ROUND TRUNNION FRAME KOB:(34KB) This is a very unusual early KOB with both the sounder and the key frame designed as circles. The maker is not known. 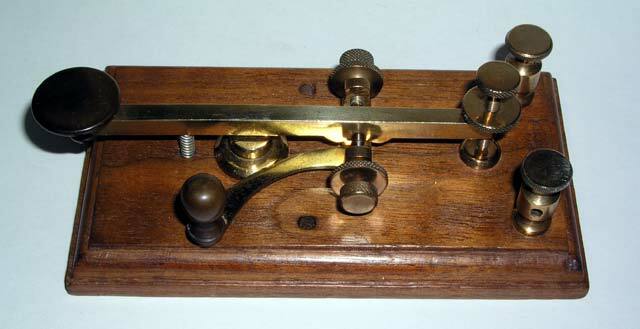 275 * CAST-BASE LEWIS KEY PRIVATE-LINE KOB:(21KB) This set has a Lewis-patent key and a Lewis sounder with their bases cast as integral parts of the large cast iron base. 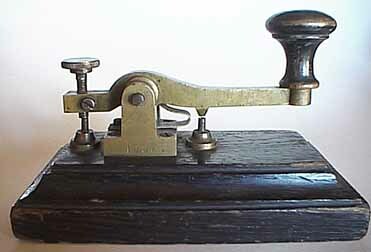 The lever of the key is stamped: Lewis Pat. 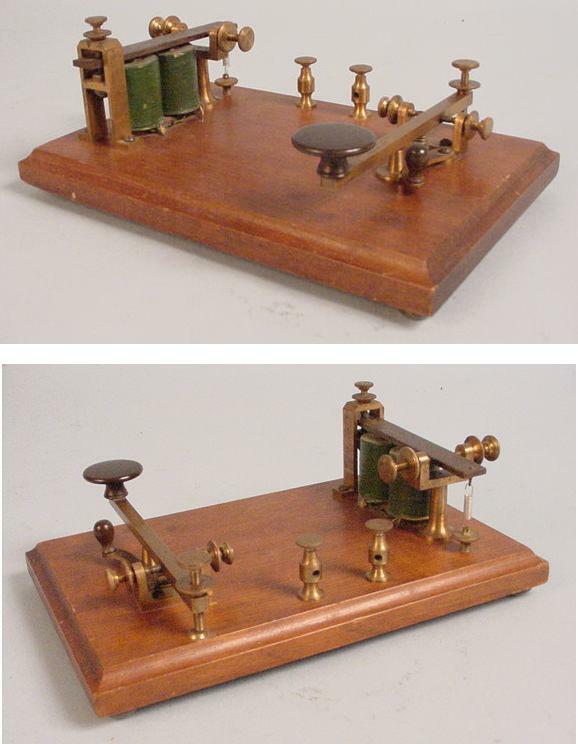 May 28, 1875, May 26, 1876 on top and Western Electric Co. Chicago on the side. (Same as item 238.). 278 * VERY EARLY CHARLES WILLIAMS (Boston) CAMELBACK KEY: This is a fine example of the camelback keys made by Charles Williams in Boston. This camelback key was probably made after the next two Williams keys. 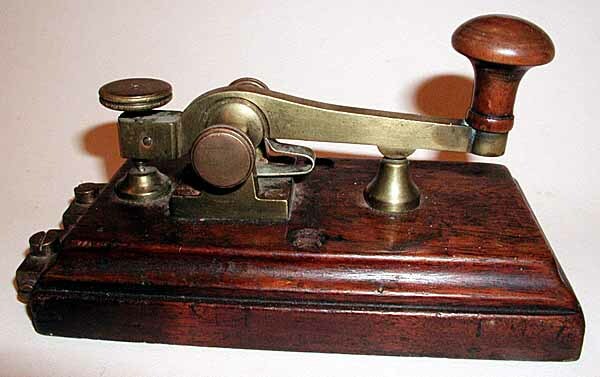 279 VERY EARLY CHARLES WILLIAMS (Boston) KEY:(30KB) Early brass straight lever key mounted on a wooden base with the Williams name stamped into the base. 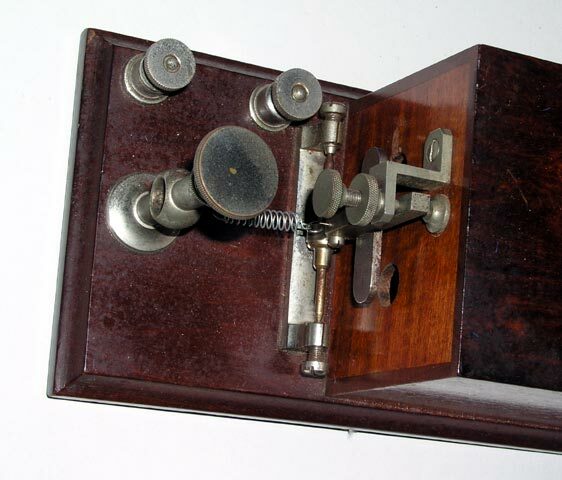 285 VERY EARLY JAMES CLARK (Philadelphia) CAMELBACK KEY & BOX SOUNDER:(35KB) Very unusual camelback key with pull-down spring at far end and Prussian-like upswept lever mounted on wooden base with early wooden box sounder. Circa 1850s. 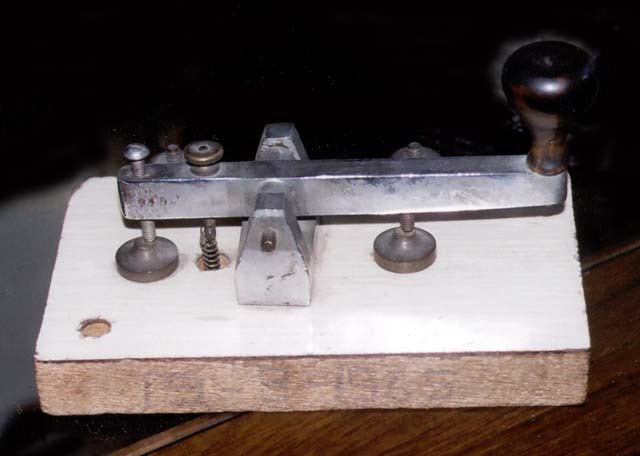 285a Closer view of key:(48KB) This view shows the shape of the lever and placement of the spring. 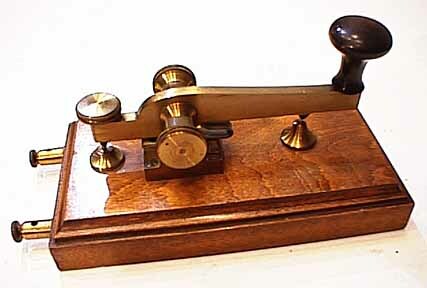 298 SOUNDER D'EXERCICE:(56KB) Unique old miniature wooden resonator on pedistal with wooden key pivoted at base. 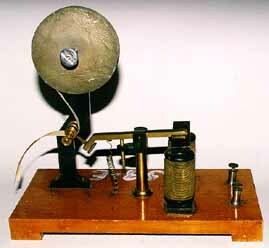 Key mechanically connected to a bar which strikes an anvil inside the resonator making clicking sounds for practicing sending & receiving. 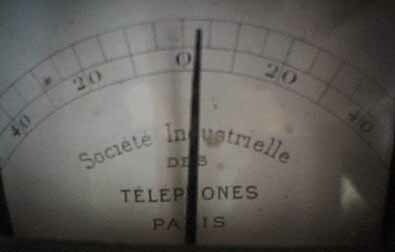 Marked:SOUNDER D'EXERCICE,Alban La FON,EVEREUX. Signed R.Guillet,PTT twice. 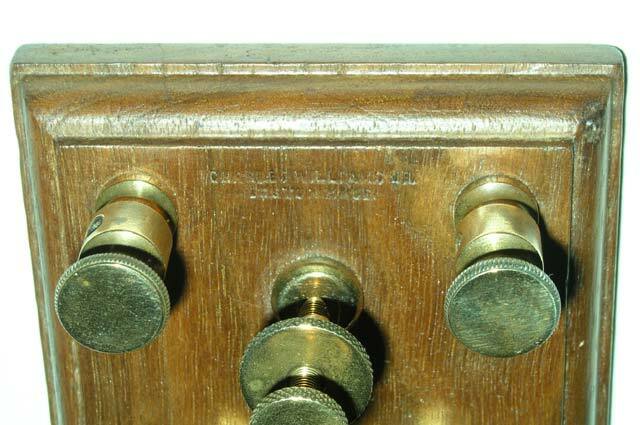 315 BUNNELL NON-ELECTRIC PRACTICE SET:(39KB) Brass, horizontally-mounted sounder lever with small telegraph key knob attached directly to it. 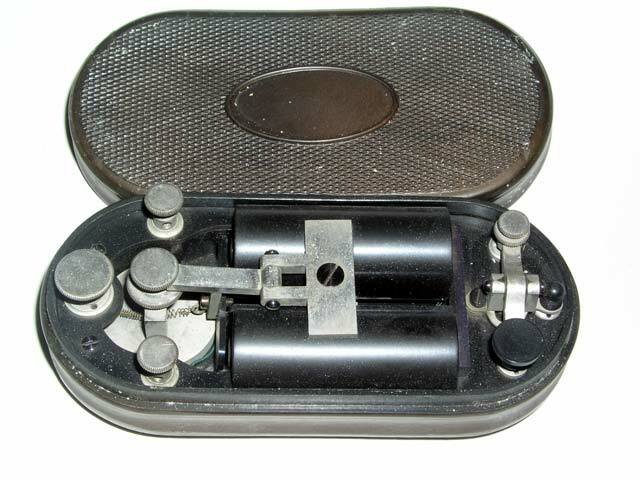 It was used to provide practice clicking sounds for people learning the Morse code without the need for batteries and wiring. Japanned, pinstriped frame on wooden base. Original box & stamps. 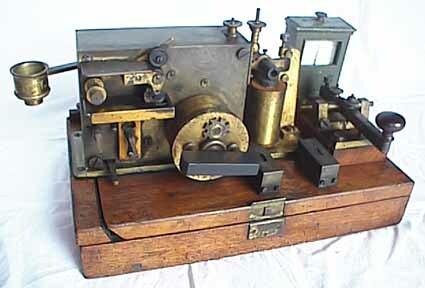 325 BUNNELL ARTICULATED NON-ELECTRIC PRACTICE SET:(15KB) Interesting combination of a brass sounder and telegraph key with a mechanical connection whereby pressing the key causes the sounder to move downward to make a click. 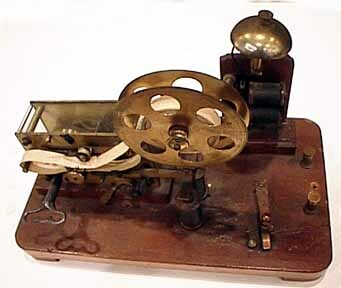 It was used to provide practice sounds for people learning the Morse code without the need for batteries and wiring. 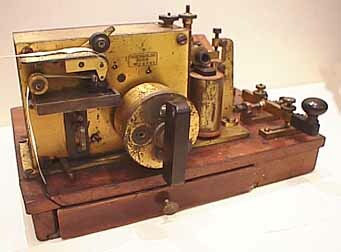 405 KNUDSEN MORSE REGISTER:(62KB) Made by Cornelius Knudsen in Denmark. 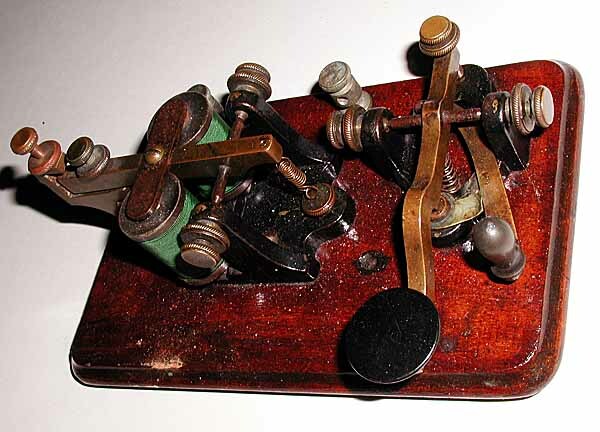 - circa 1850 Before it was discovered that the Morse code could be copied by ear, "Registers" were used to print the characters on a paper tape for later transcription. 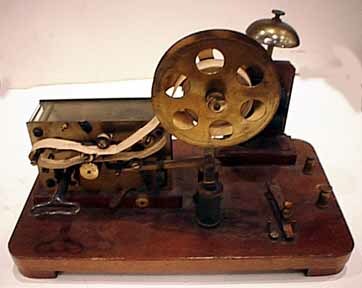 These spring powered Registers continued to be used because they were thought to be more reliable than sound copy and because they made a permanent record. 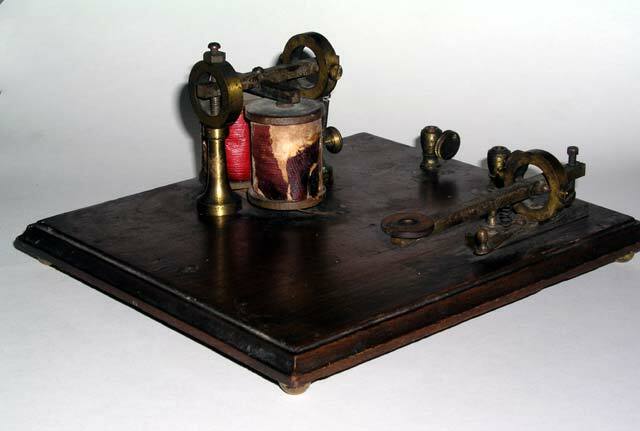 This is a very early brass register with an unusual armiture which presses the paper tape up against the (missing) pen to mark dots or dashes on the tape in ink. 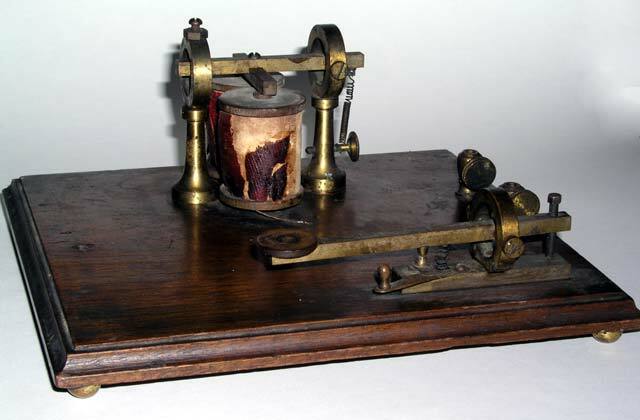 It has a key wound mechanism (with key) which runs constantly. 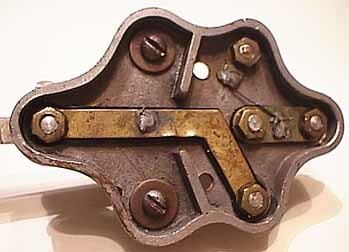 Early all brass frame with brass armiture stamped L.G.Tillotson, 8 Dey St. New York with steel trunnion crimped into brass armiture. Horizontal adjusting spring. Wooden base. 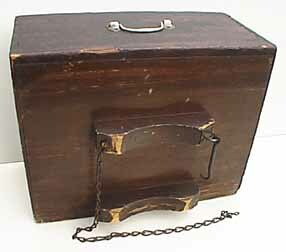 Notice the box-like anvil. 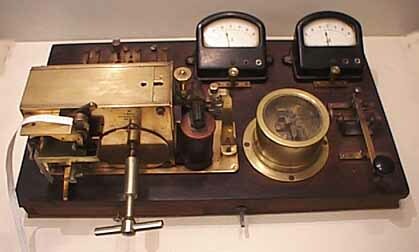 It is similar to the Williams Sounder (Number 280) and the Putt practice set sounder (Number 281) seen above although those anvils were mounted on a single upright post. 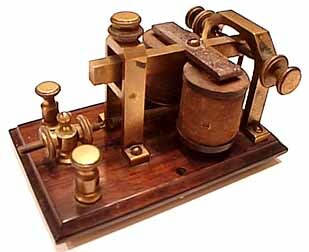 685 * VERY EARLY L.G.TILLOTSON SOUNDER: Very early all brass frame with brass armiture stamped L.G.Tillotson, 26 Dey St. New York with steel trunnion crimped into brass armiture. Horizontal adjusting spring. Wooden base. 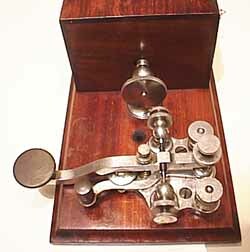 690 UNUSUAL VERY EARLY ROUND L. G. TILLOTSON SOUNDER:(29KB) Ornate brass design with brass armiture stamped L.G.Tillotson, 8 Dey St. New York, with steel trunnion crimped into brass. Horizontal adjusting spring. All mounted on ROUND plated brass base. 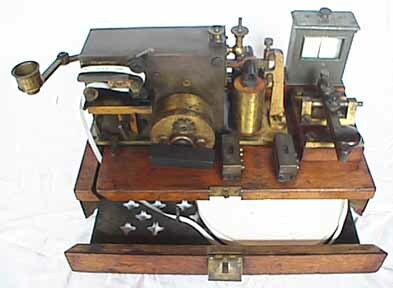 691 * VERY EARLY TILLOTSON SOUNDER: Medium size, all-brass sounder in excellent condition. 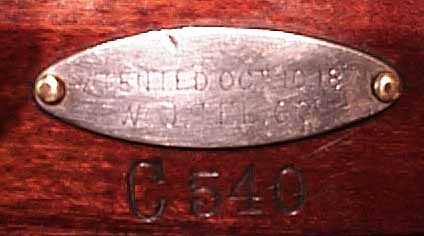 Armiture is stamped "L.G.TILLOTSON & Co. 5&7 Dey St. New York." and "Pat'd Feb 16, 1875". Base is also stamped TILLOTSON and same address. 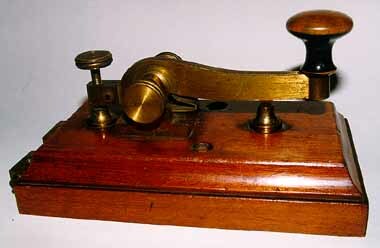 692 * VERY EARLY TILLOTSON SOUNDER: Similar to above but smaller. 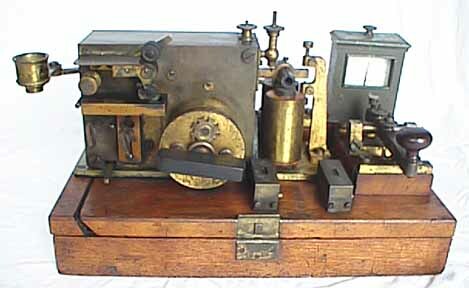 Armiture patent reads "Patent July 1874. No address on base. >Traded out. 693 * UNUSUAL TRANSITIONAL SOUNDER WITH VERTICAL AND HORIZONTAL SPRINGS:(17KB) This is an interesting sounder which has parts for both horizontal and vertical springs. 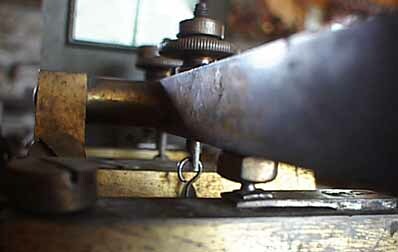 Although the Anvil is broken off, you can see where the horizontal spring adjusting screw was mounted. 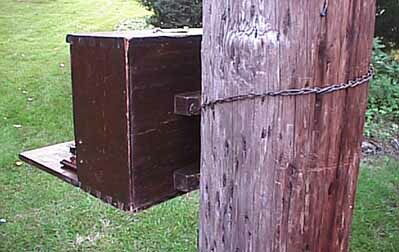 You can also see how the vertical spring was mounted. 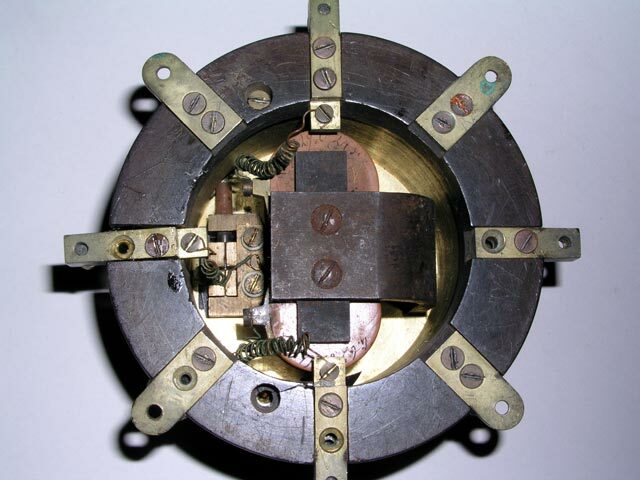 The transition from horizontal springs to vertical springs is generally believed to signal a major shift in sounder design strategy and this sounder appears to incorporate both designs. 694 * VERY EARLY GREELEY SOUNDER: All plated. E. S.GREELEY & CO. 5 & 7 Dey St. New York. 740 VERY UNUSUAL SOUNDER-ACTUATOR? 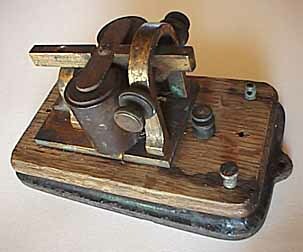 :(8KB) This extremely unusual sounder/Actuator was found at an abandonned railroad station in the far west. It is of cast iron construction and looks very early. 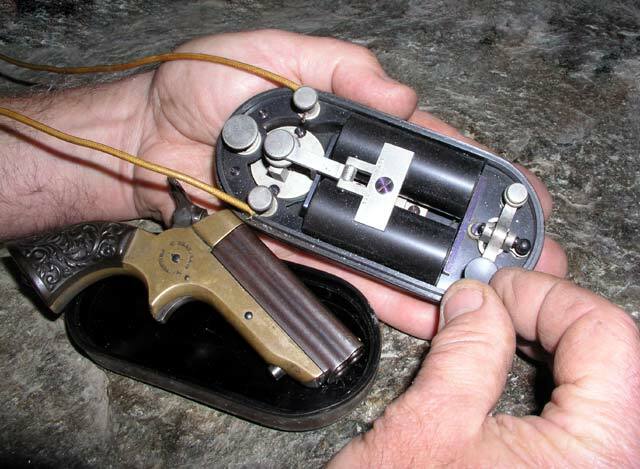 The sounder mechanism has an added long lever which allows it to act as an actuator to perhaps activate another mechanical mechanism. 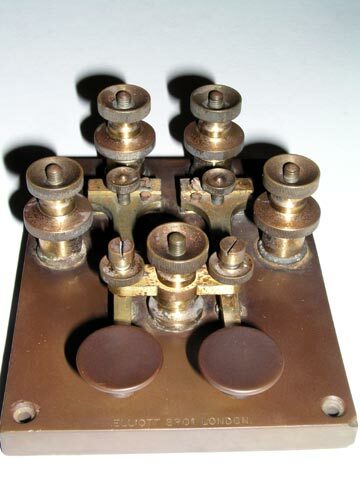 945 VERY EARLY TELEGRAPH PLUG-BOARD:(33KB) This board was used to connect office telegraph instruments to 4 telegraph lines. 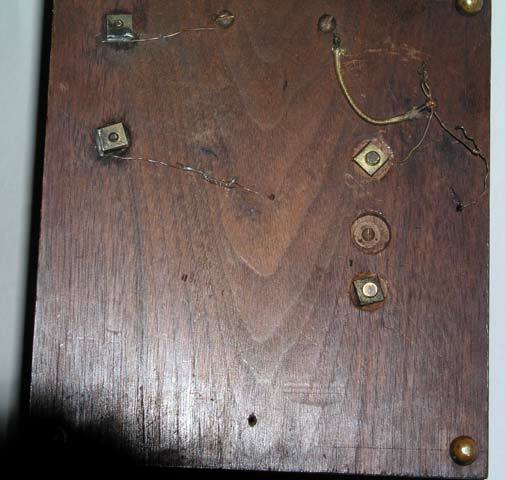 Brass plugs with insulated handles shorted the blocks together and made the connections.